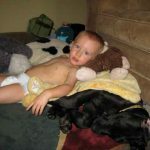 I am so amazed when I look at my Grand-Babies’ photos I see my Babies!!! 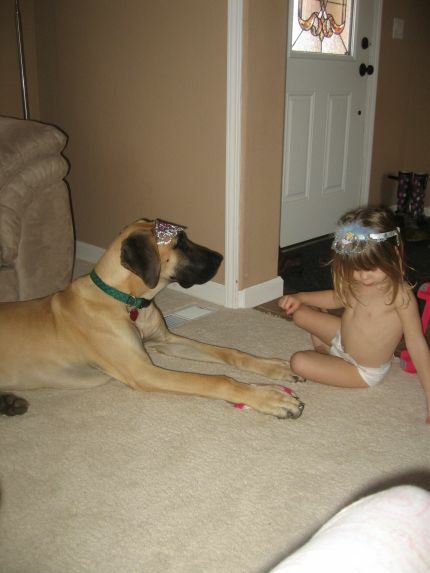 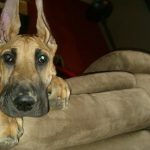 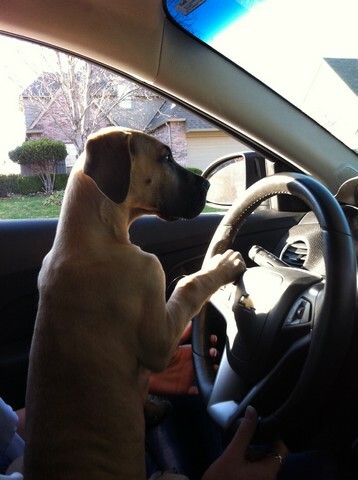 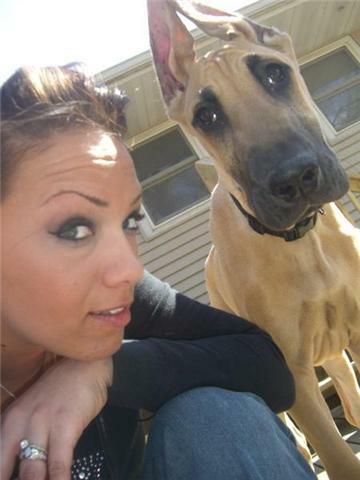 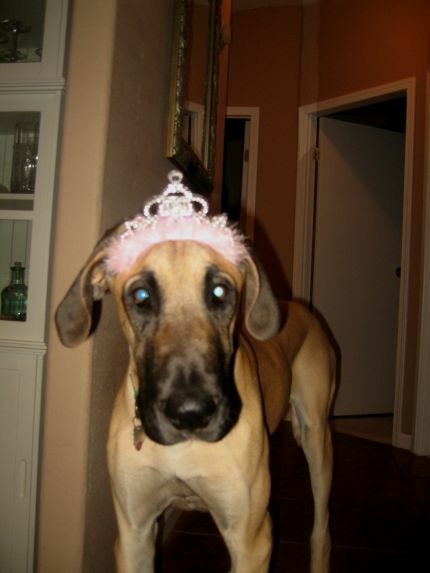 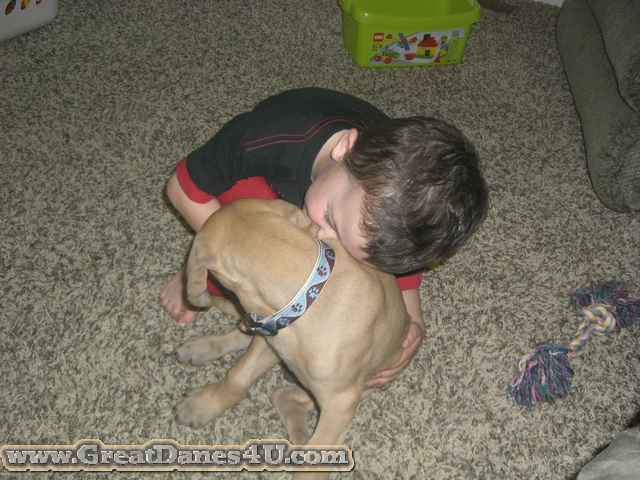 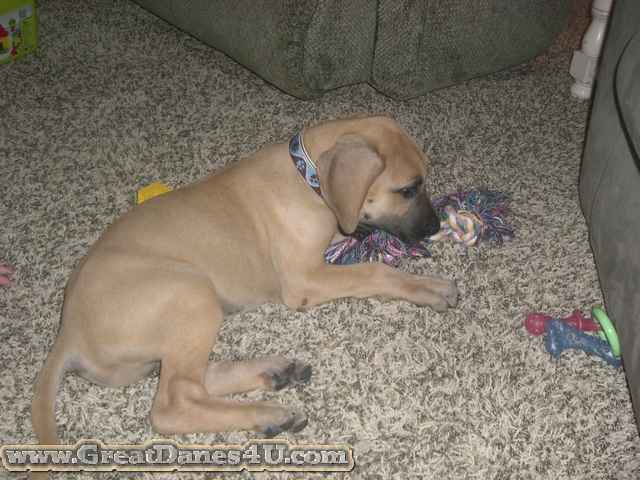 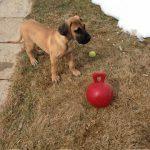 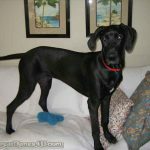 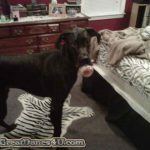 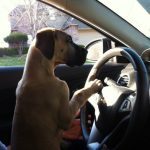 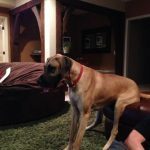 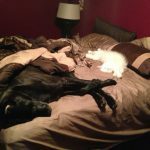 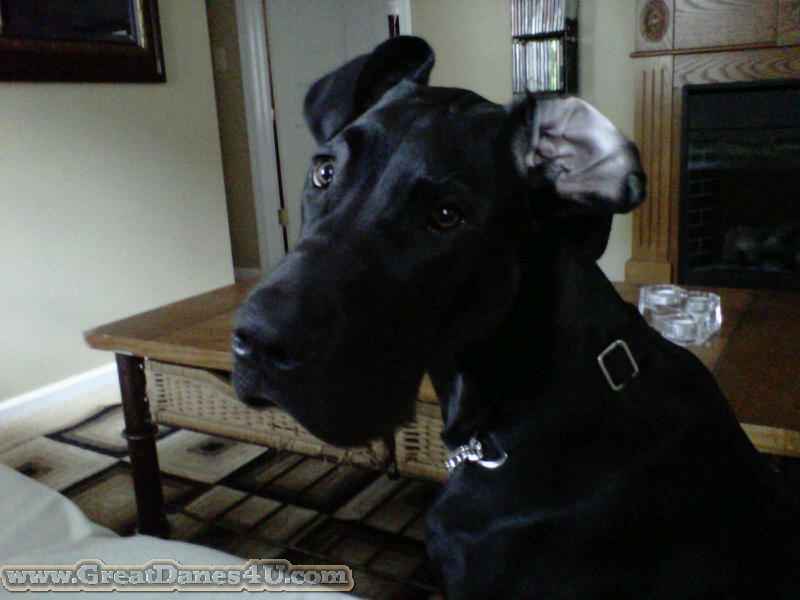 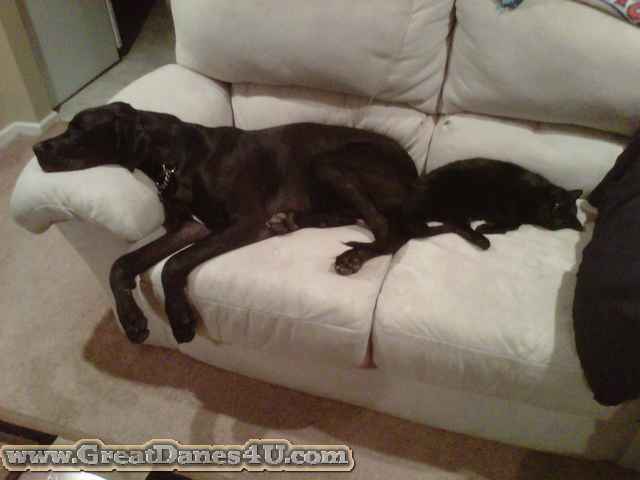 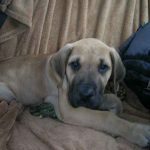 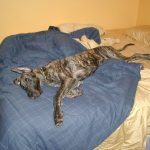 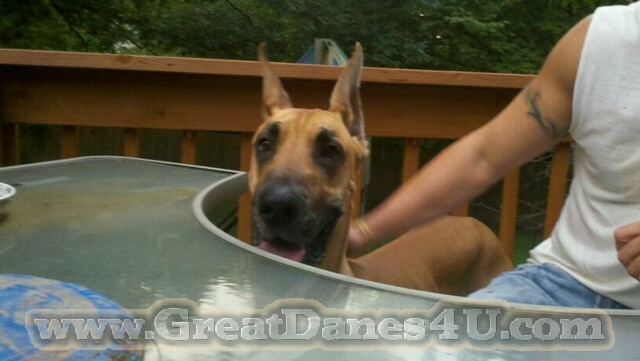 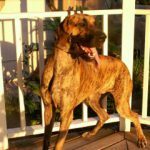 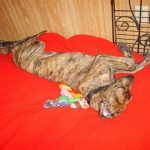 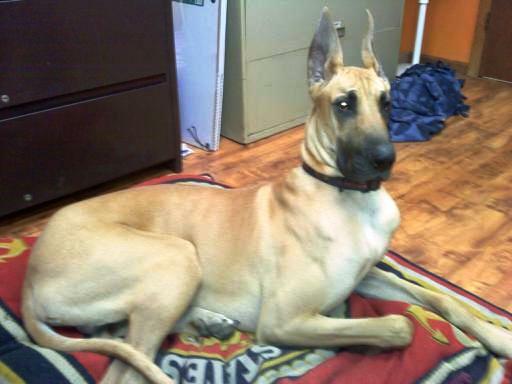 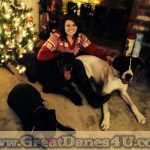 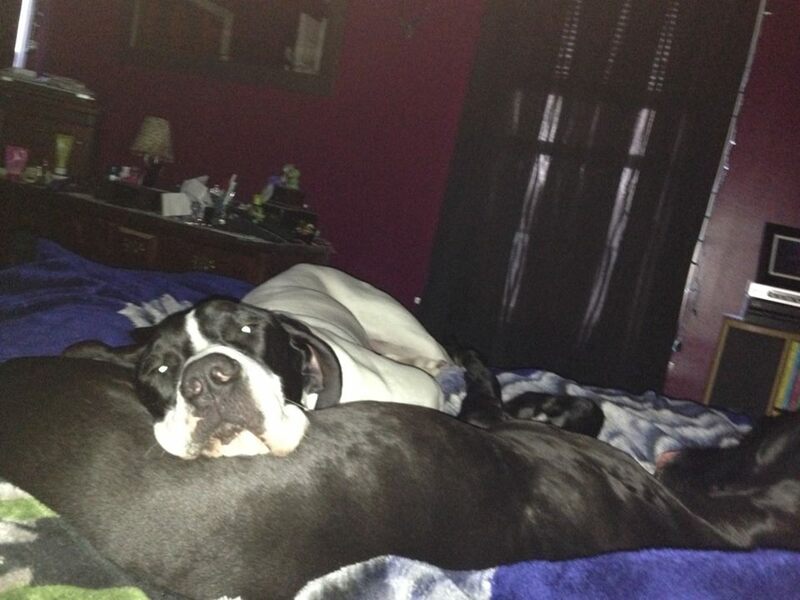 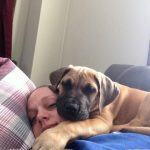 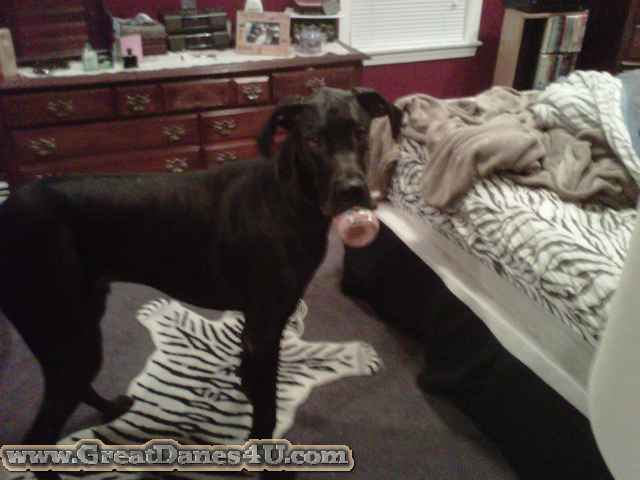 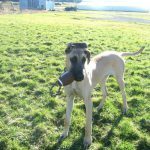 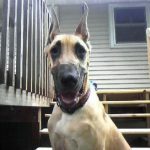 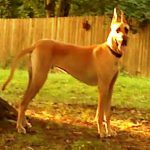 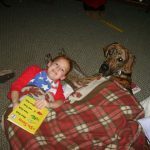 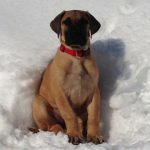 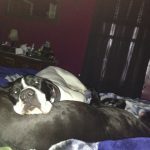 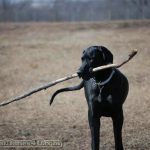 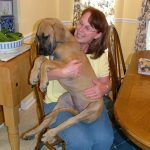 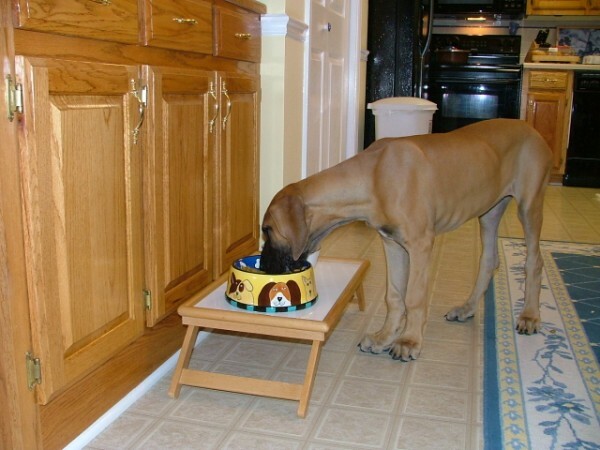 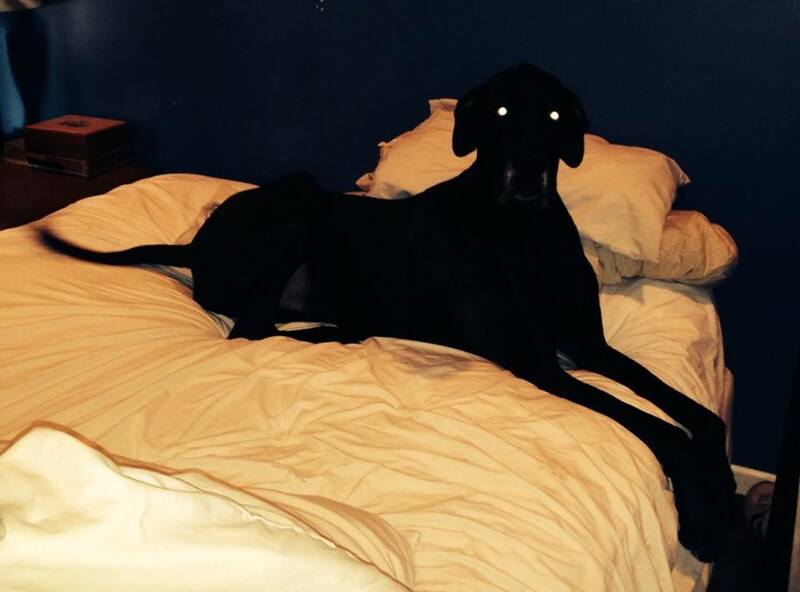 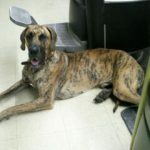 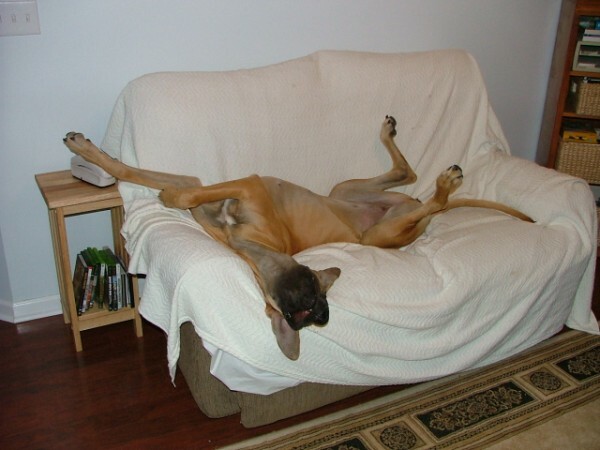 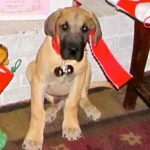 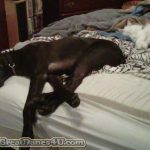 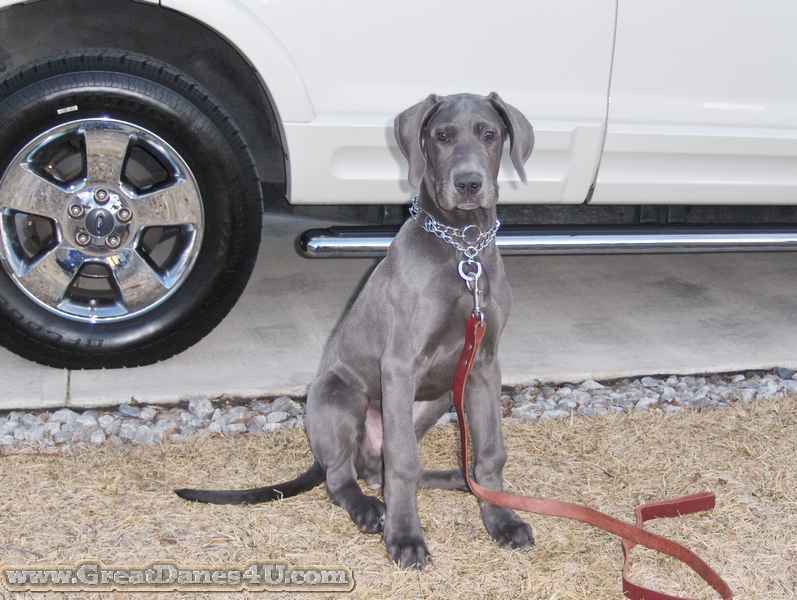 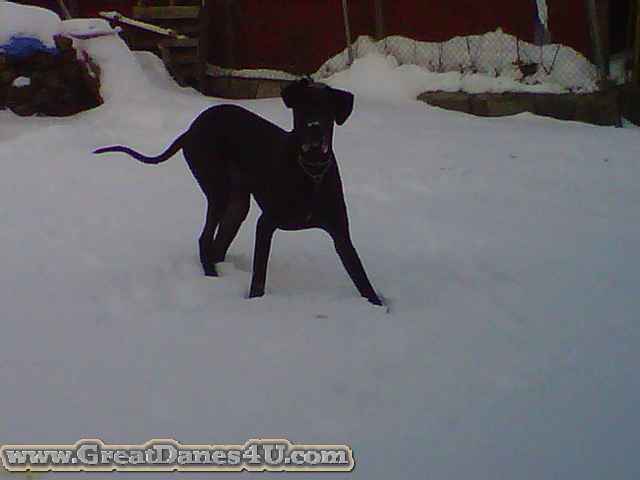 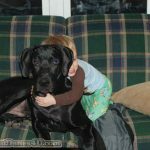 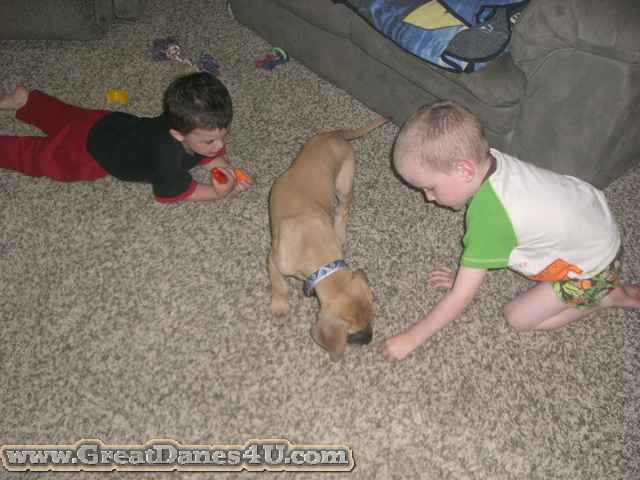 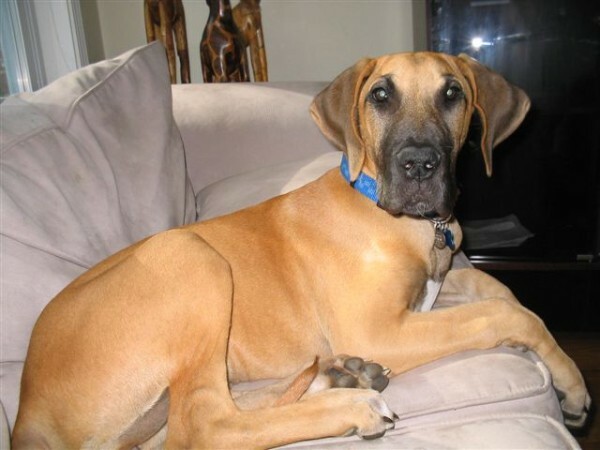 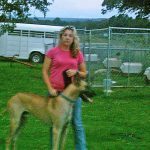 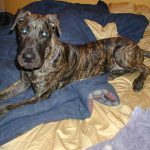 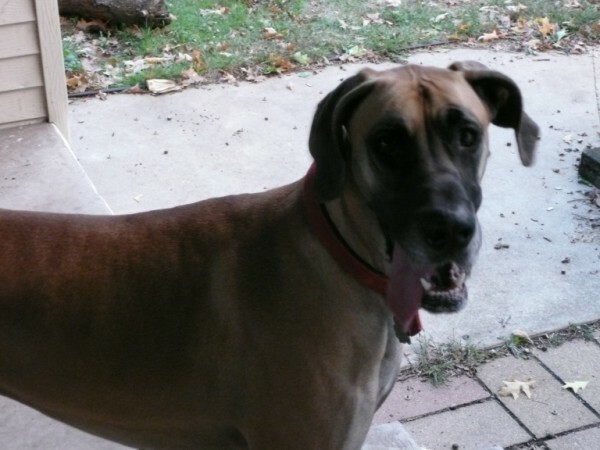 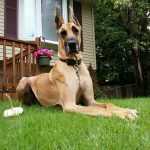 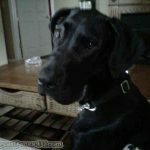 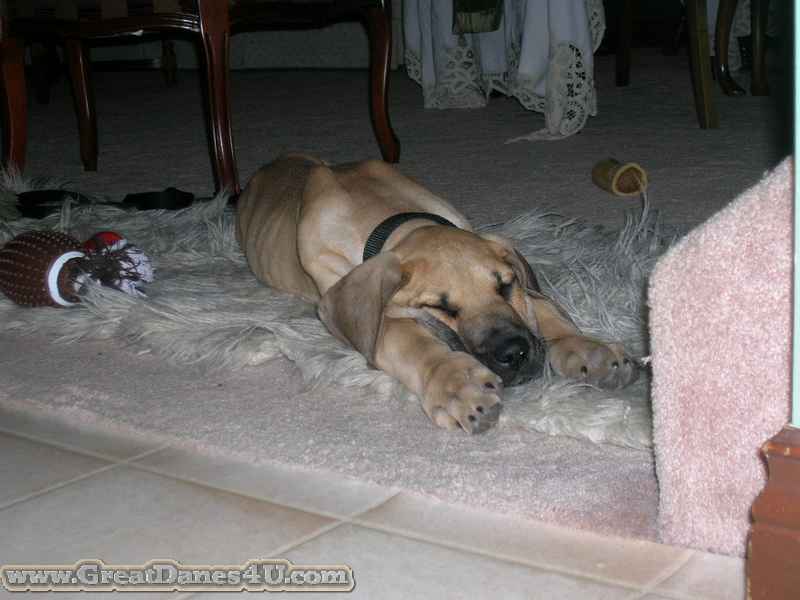 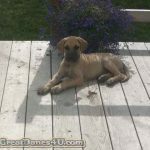 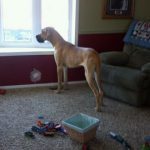 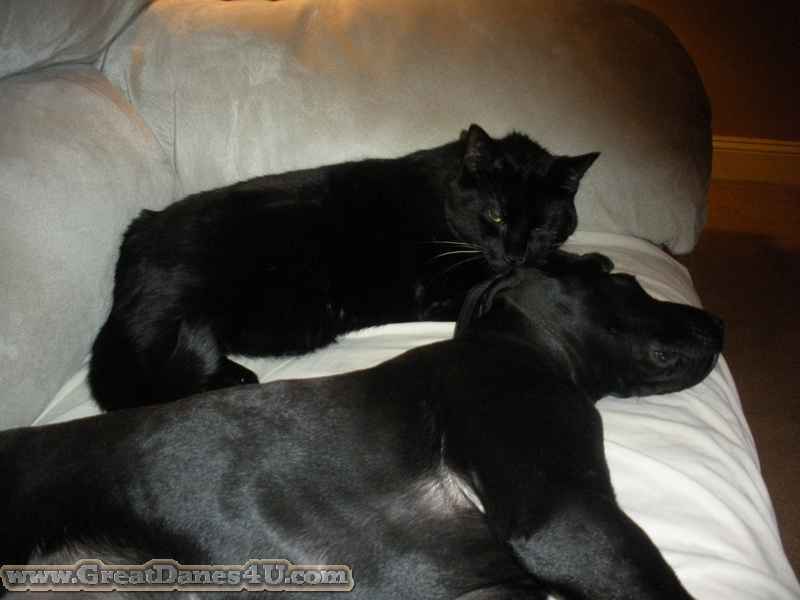 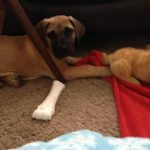 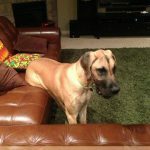 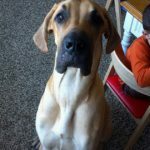 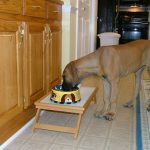 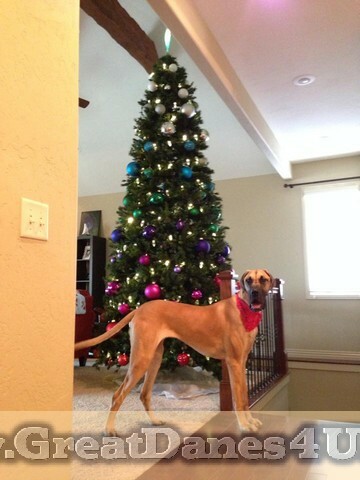 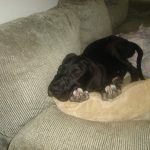 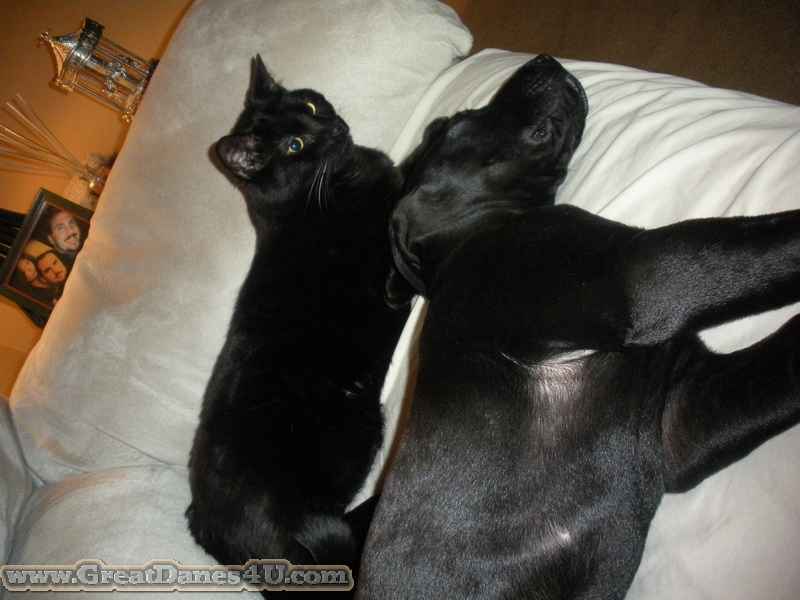 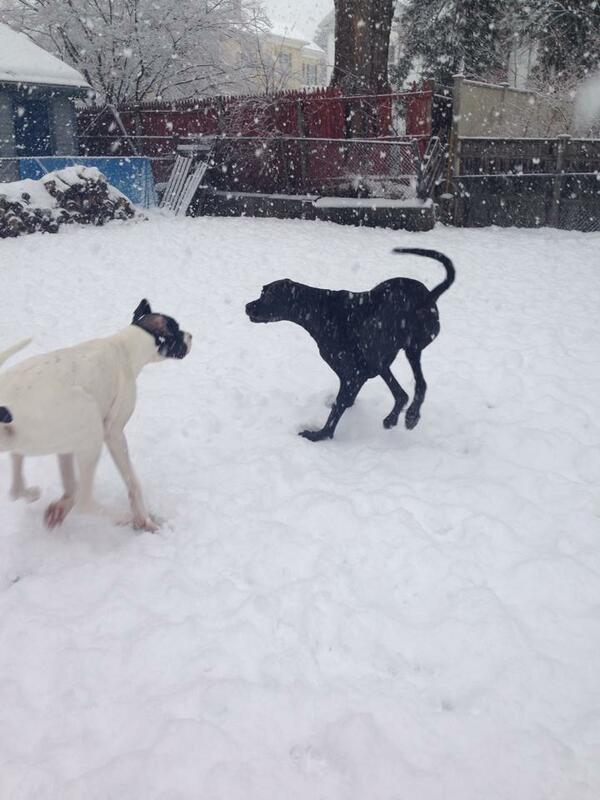 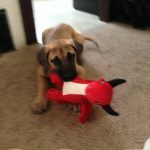 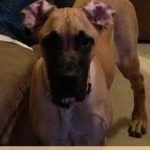 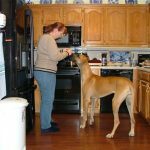 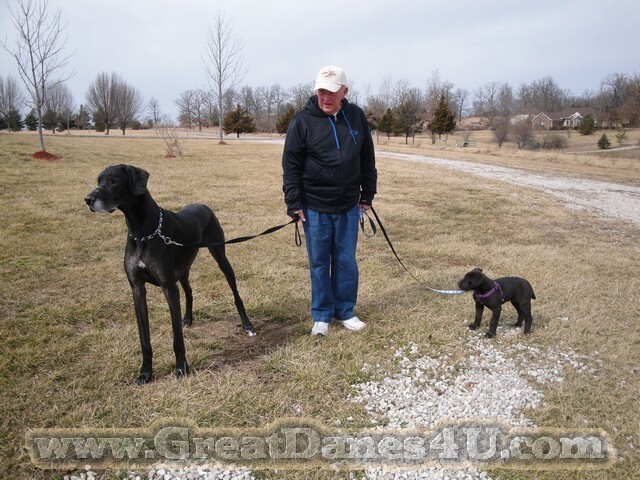 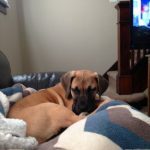 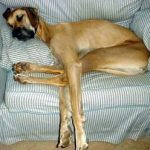 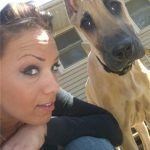 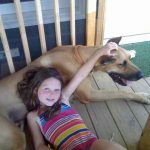 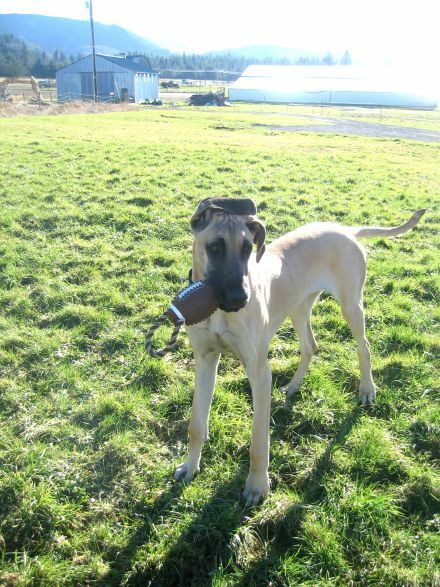 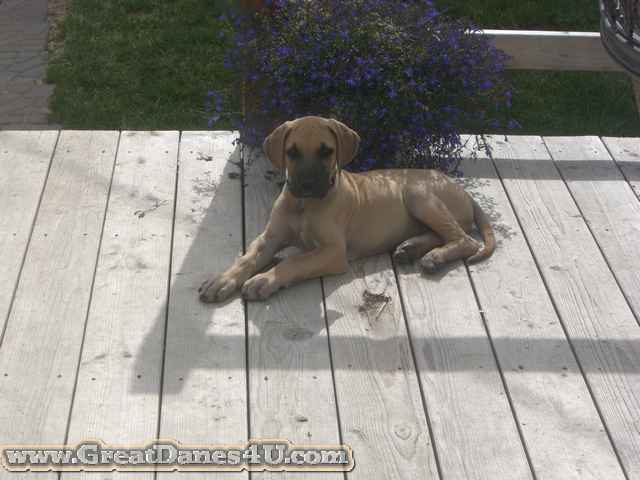 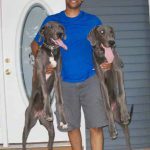 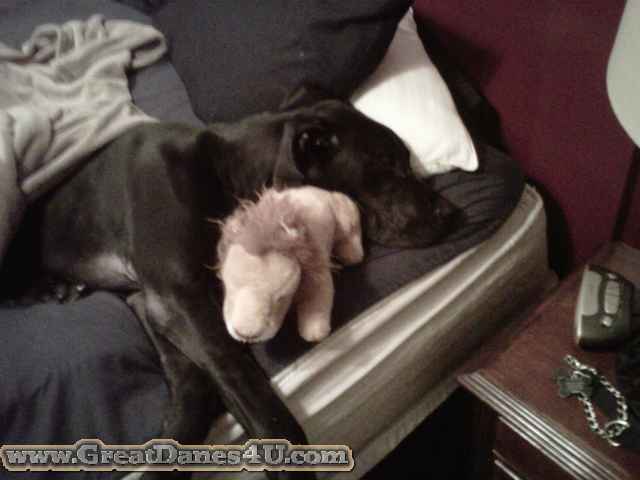 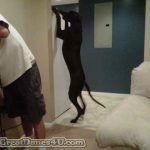 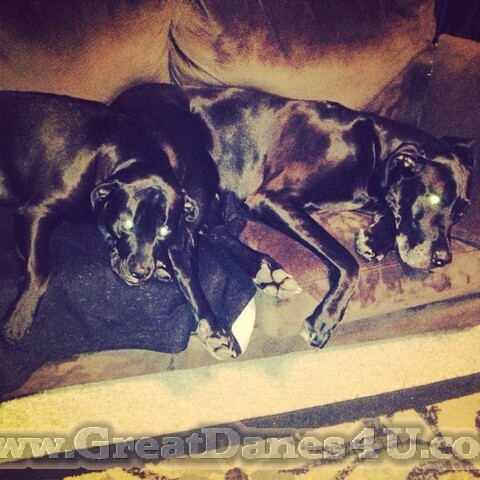 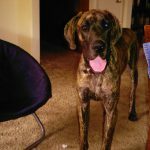 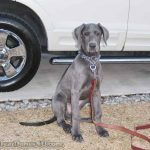 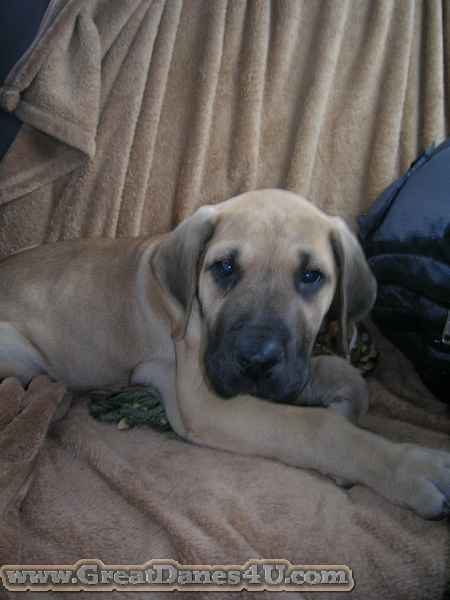 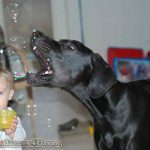 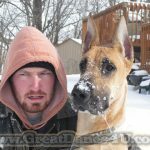 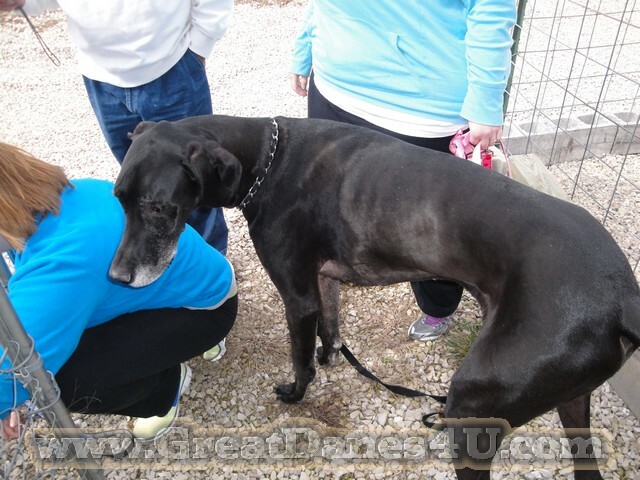 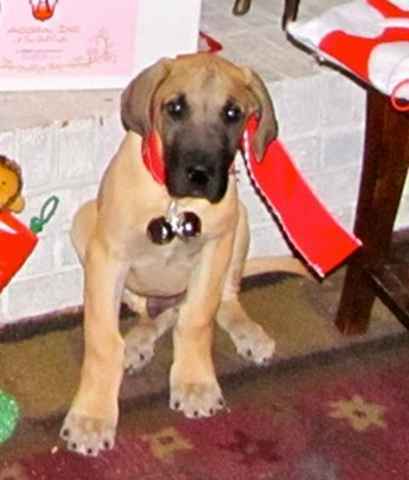 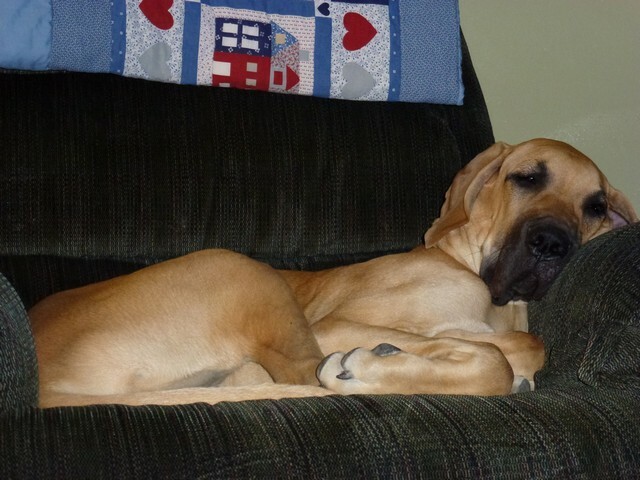 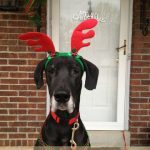 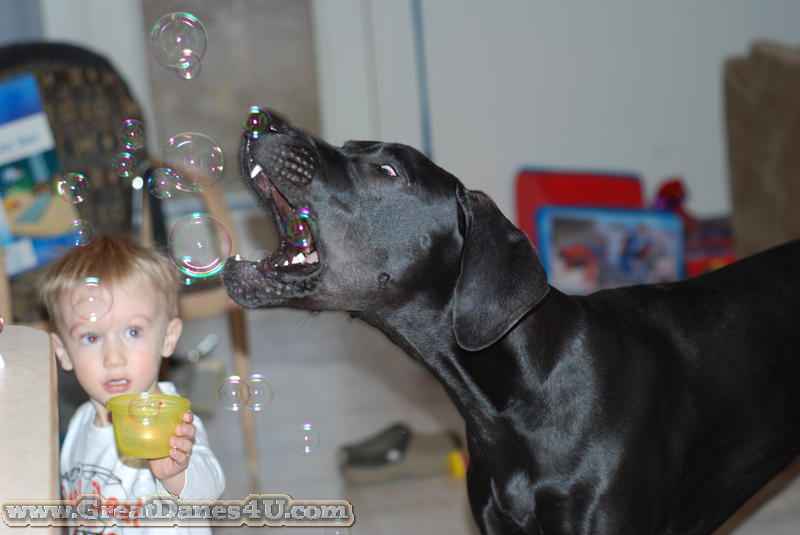 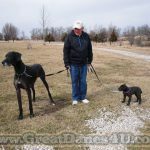 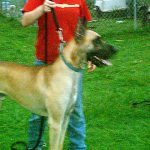 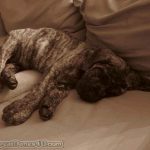 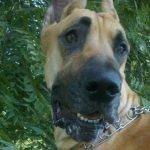 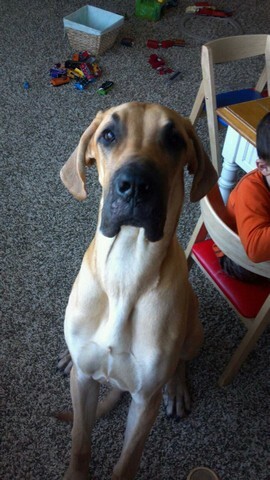 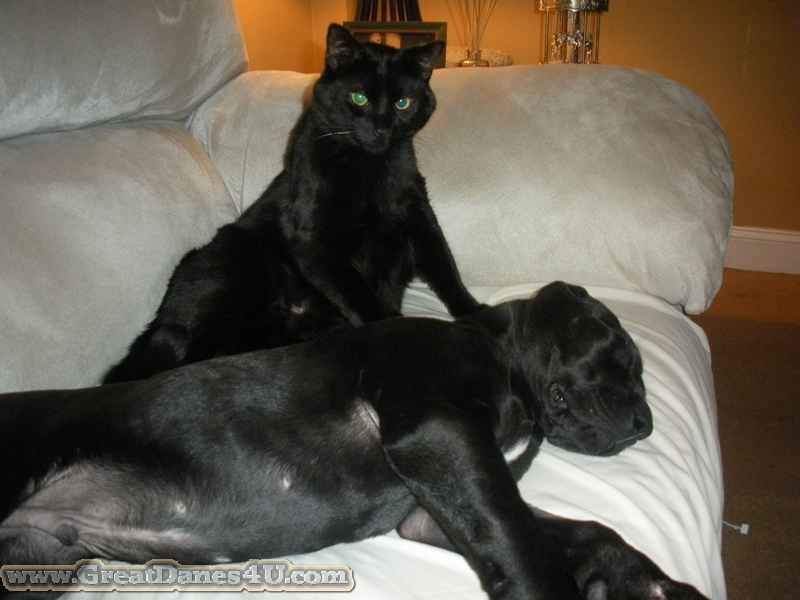 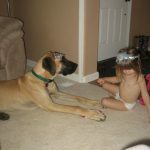 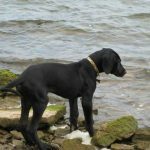 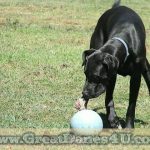 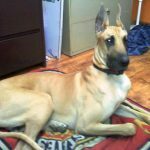 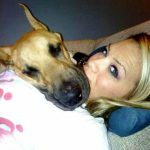 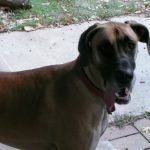 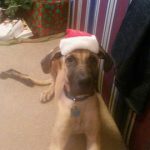 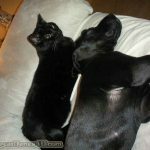 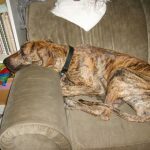 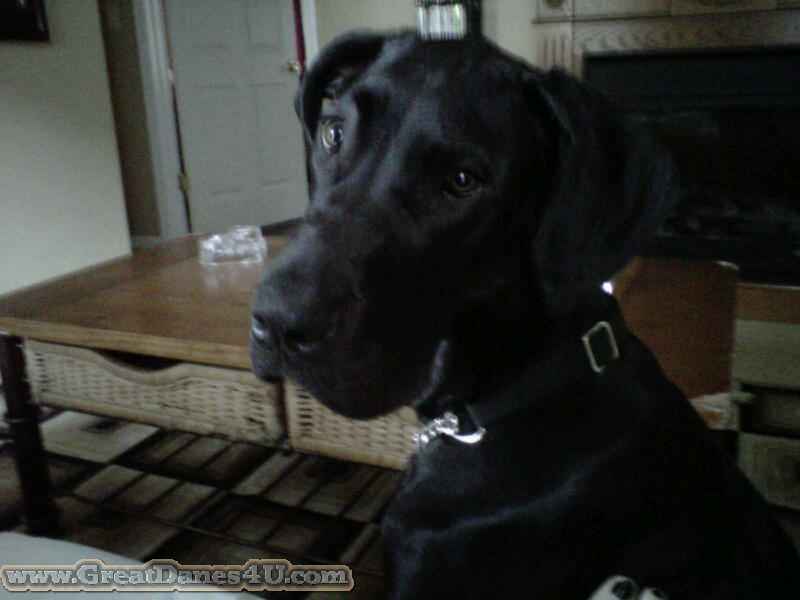 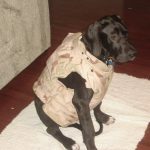 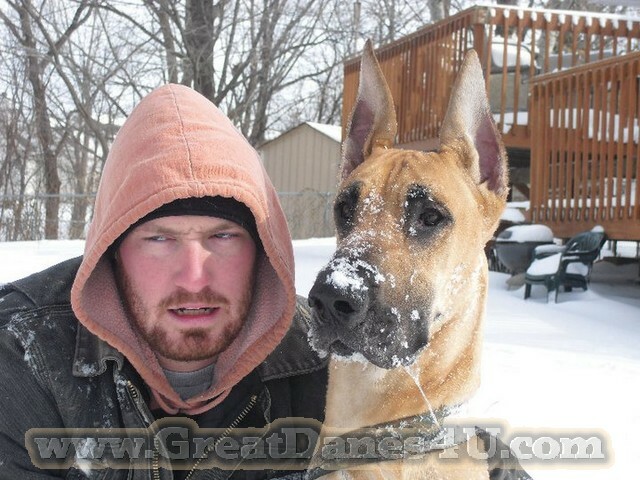 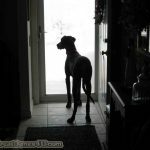 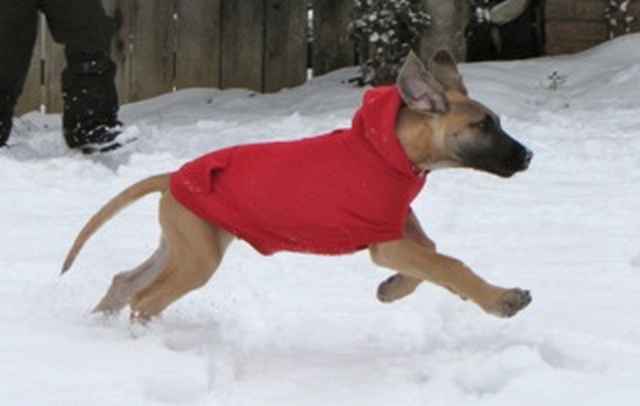 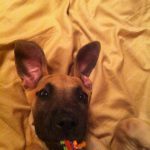 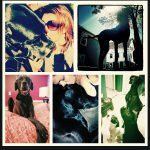 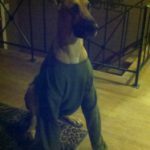 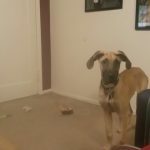 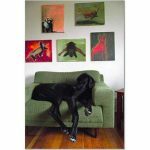 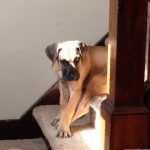 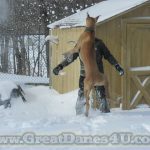 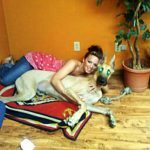 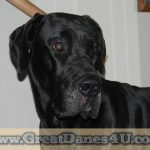 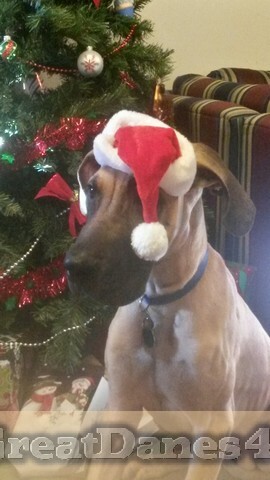 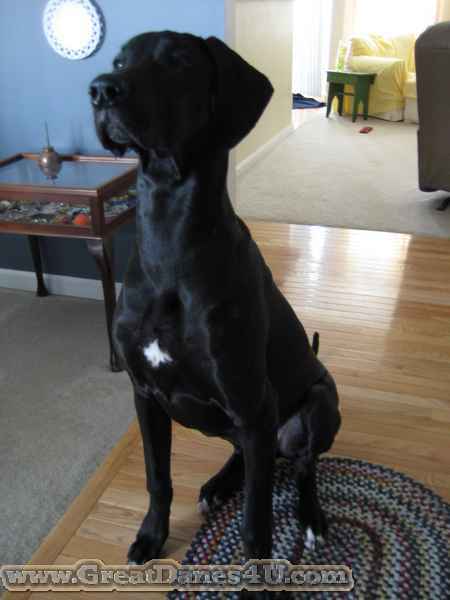 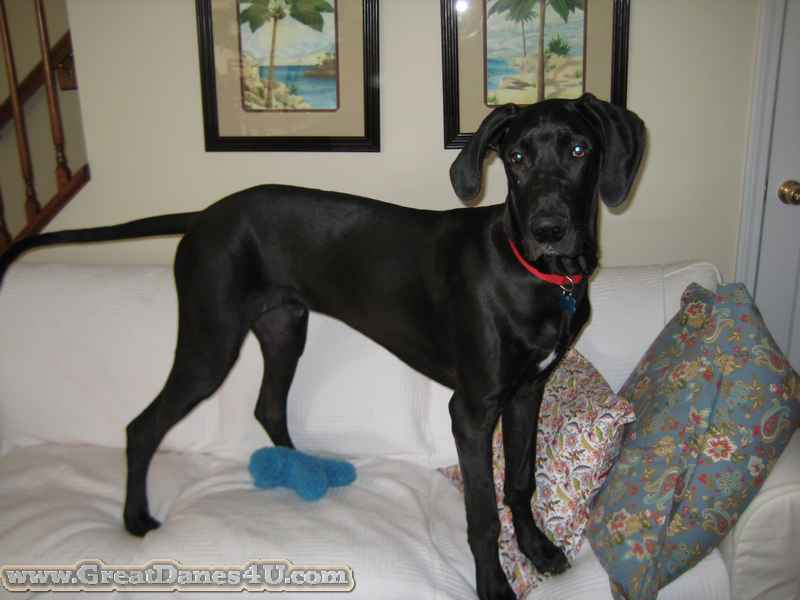 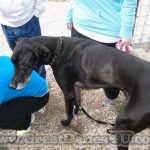 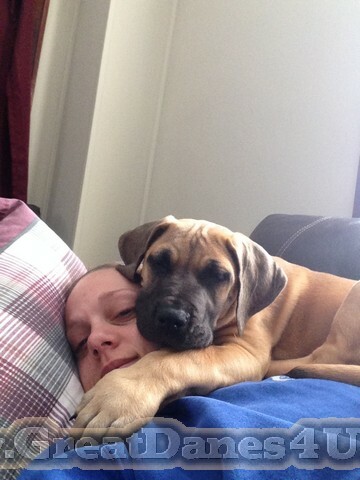 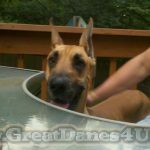 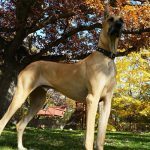 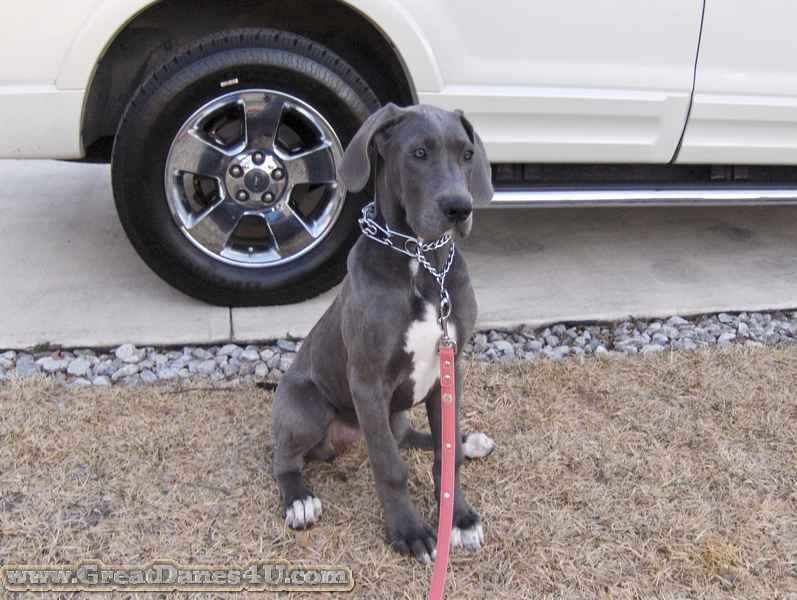 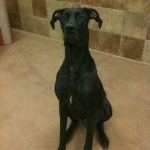 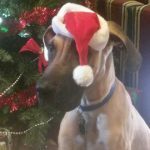 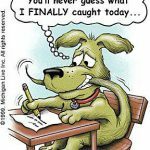 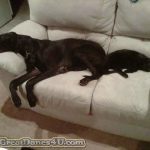 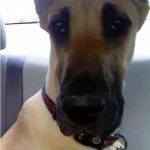 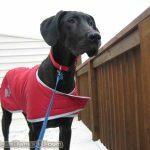 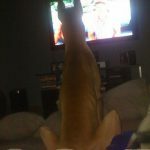 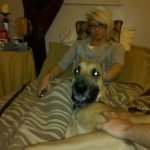 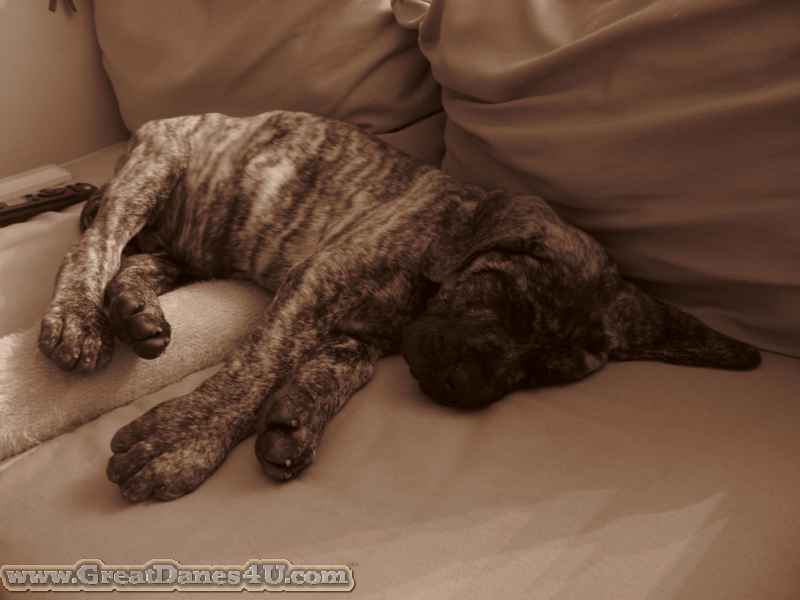 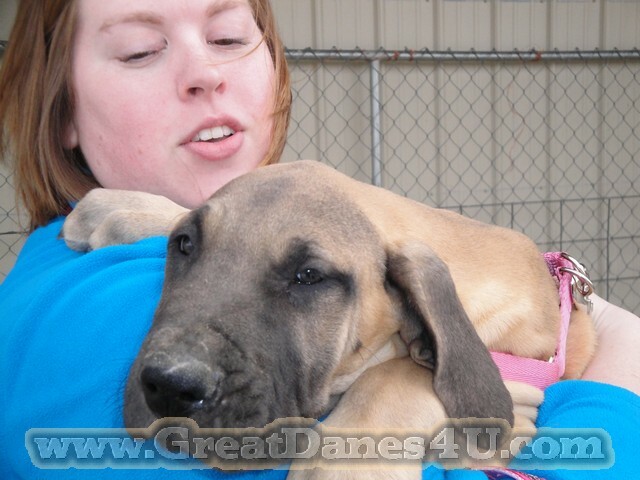 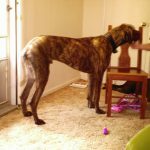 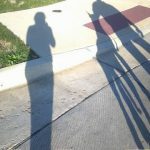 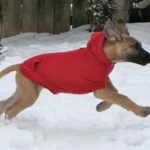 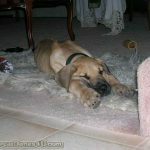 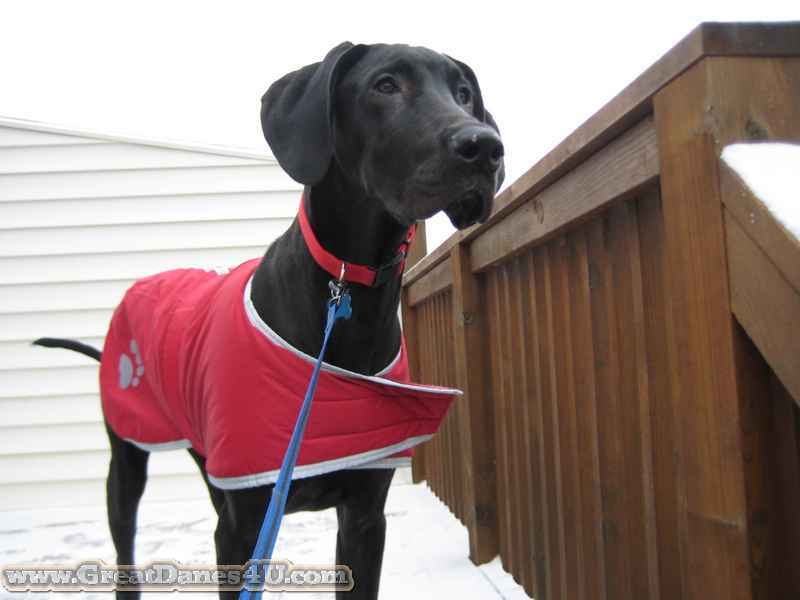 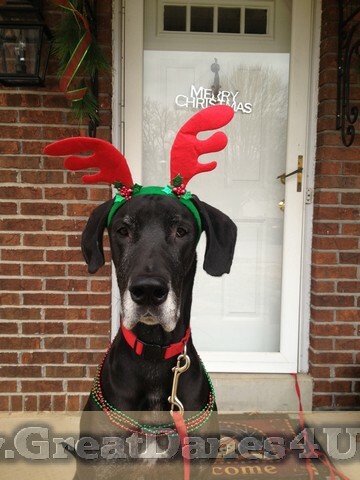 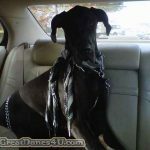 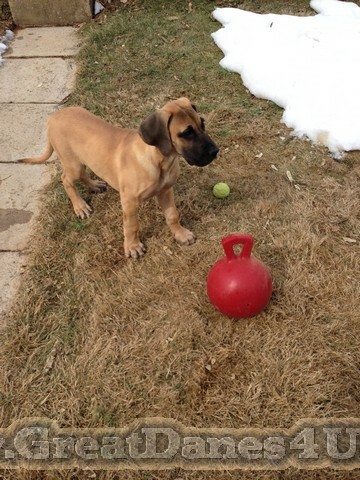 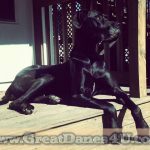 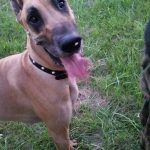 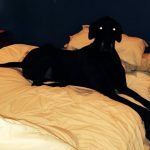 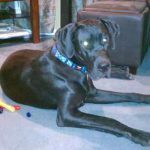 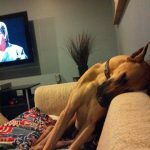 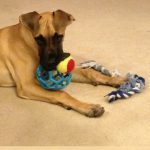 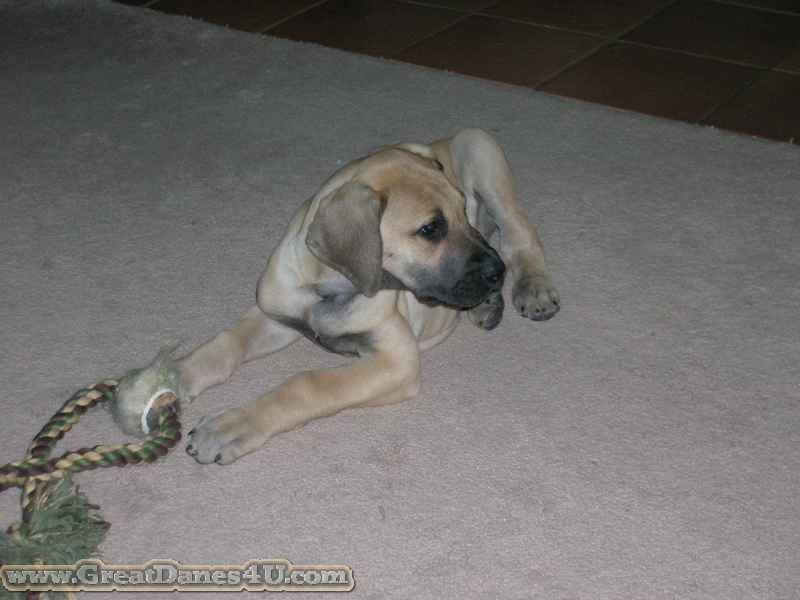 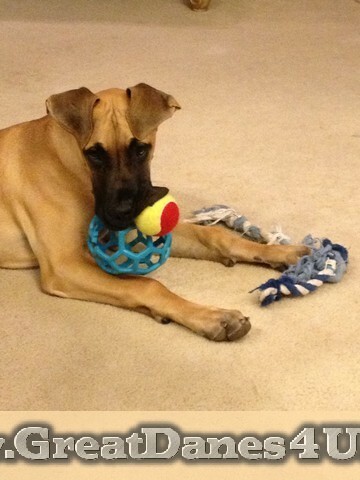 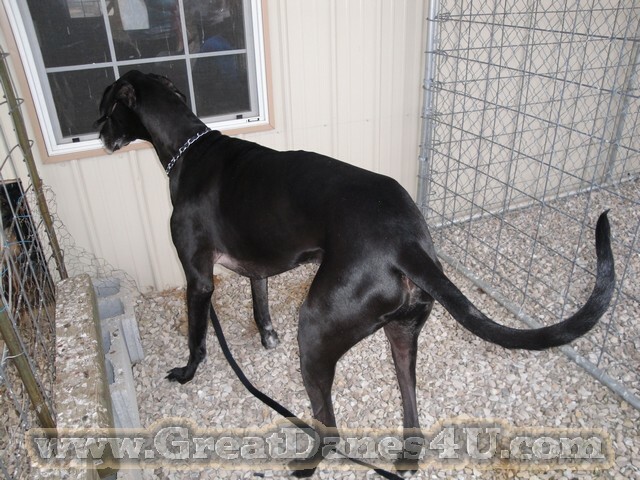 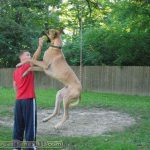 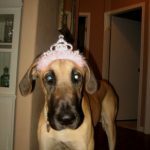 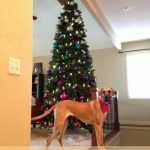 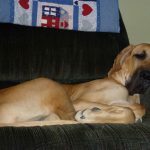 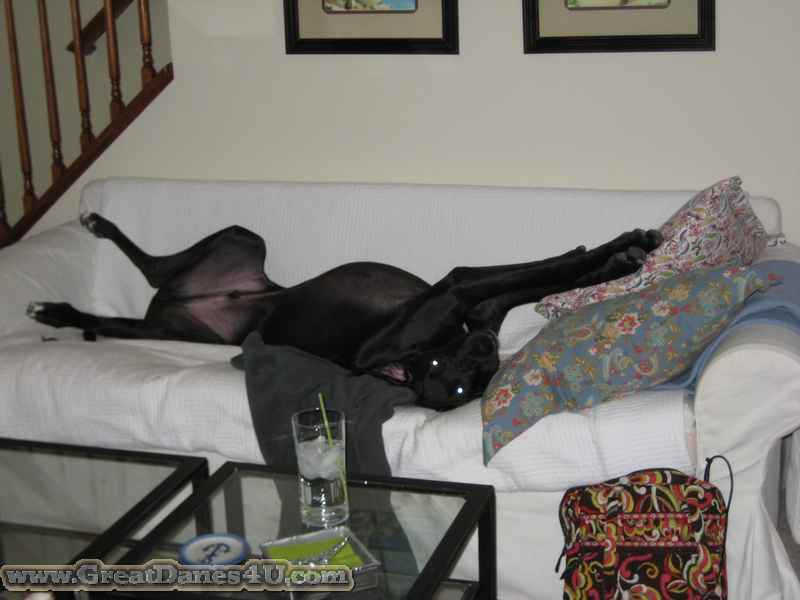 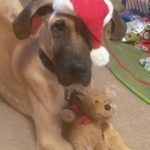 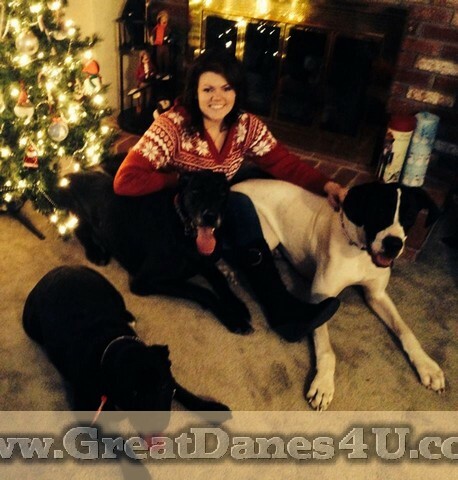 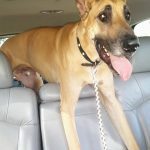 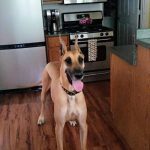 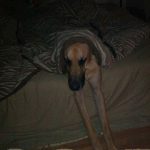 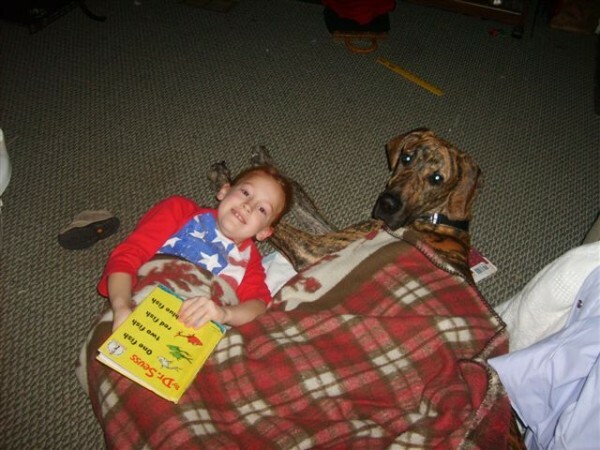 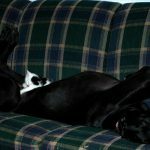 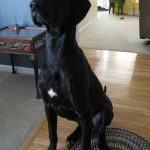 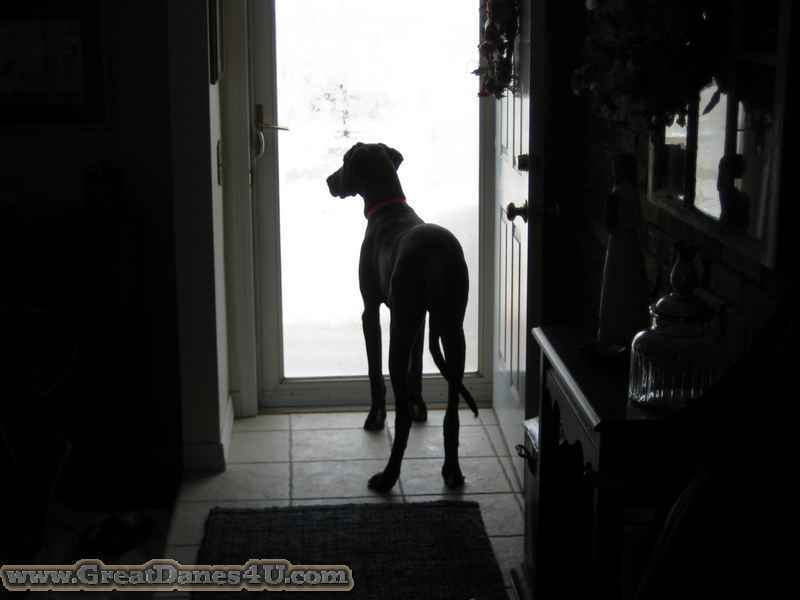 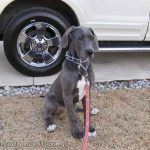 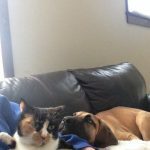 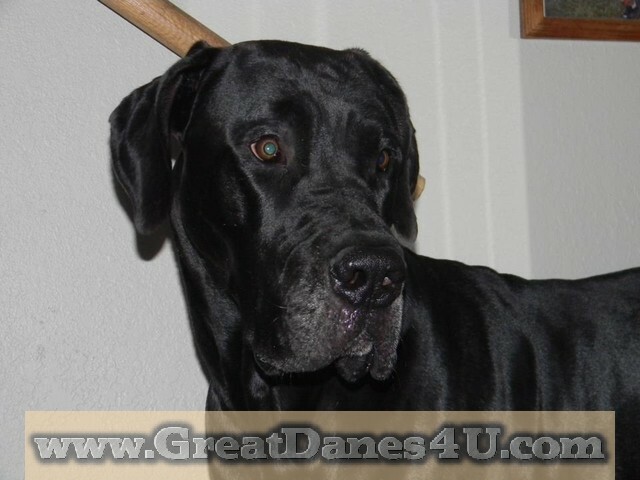 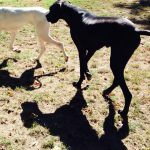 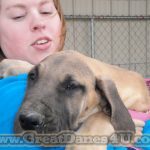 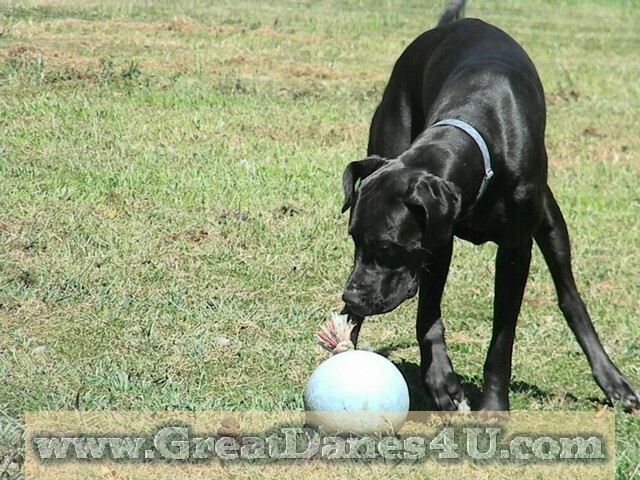 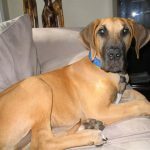 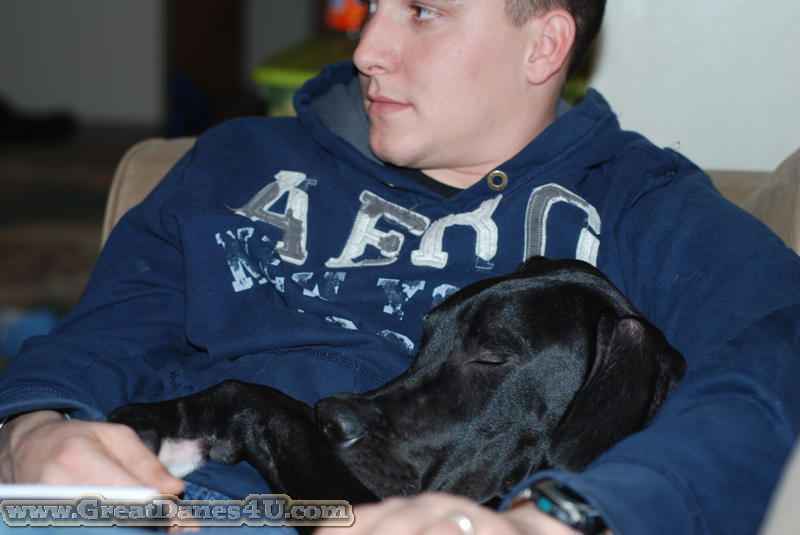 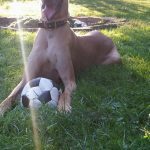 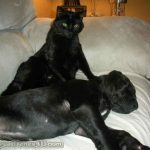 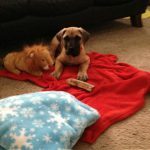 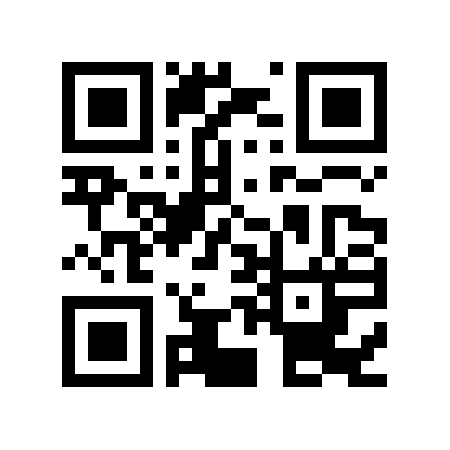 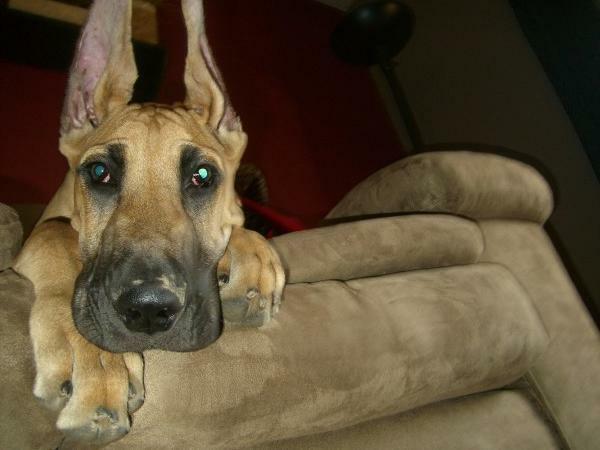 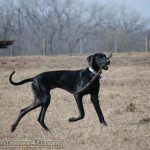 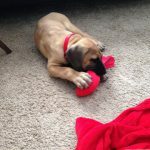 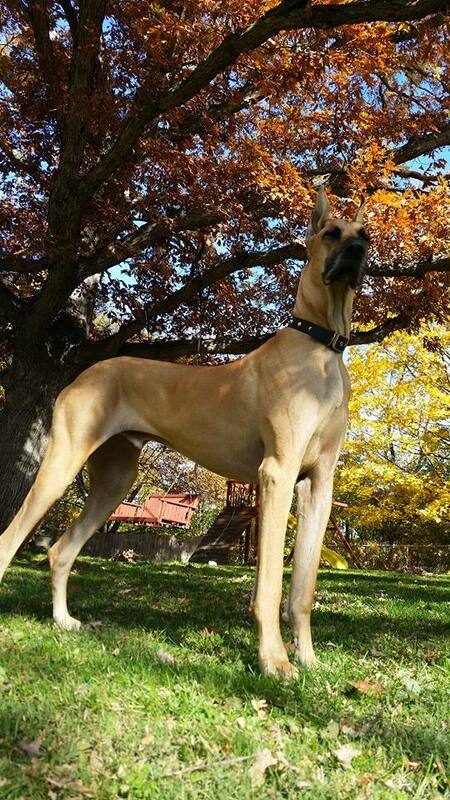 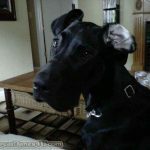 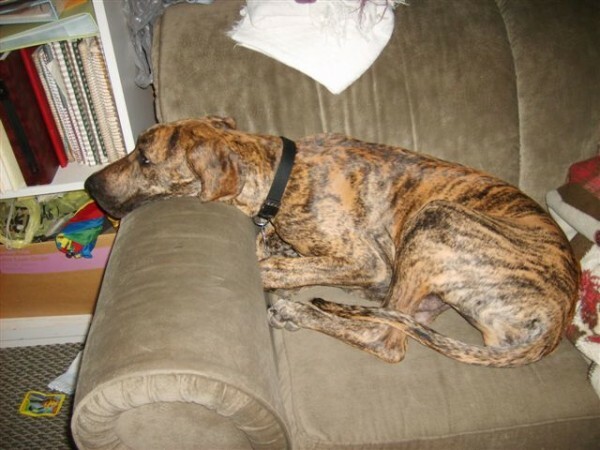 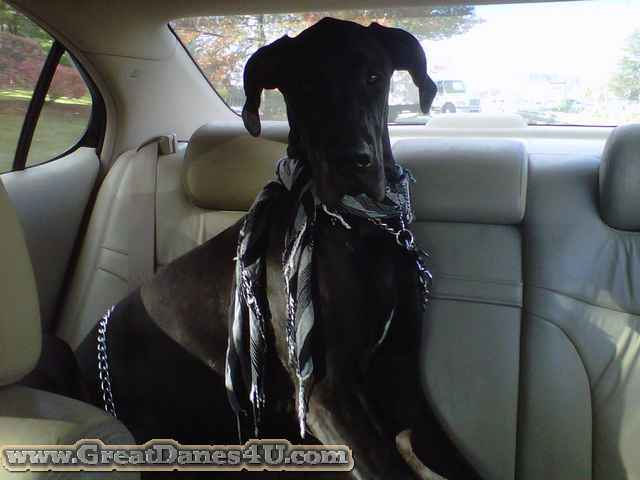 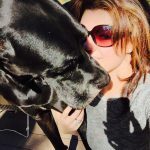 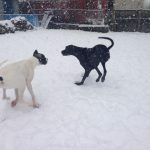 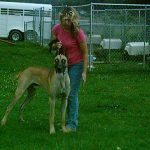 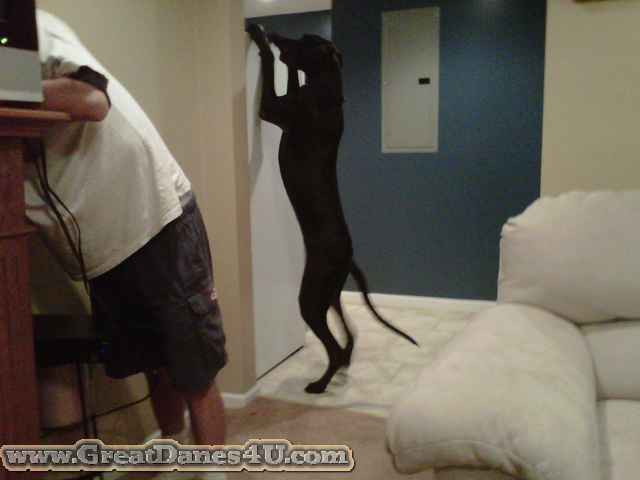 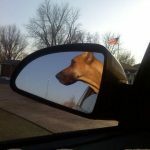 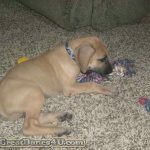 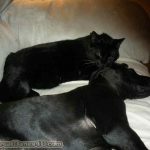 You can check out the Great Dane Parents Link on the Menu bar and see for yourself.. 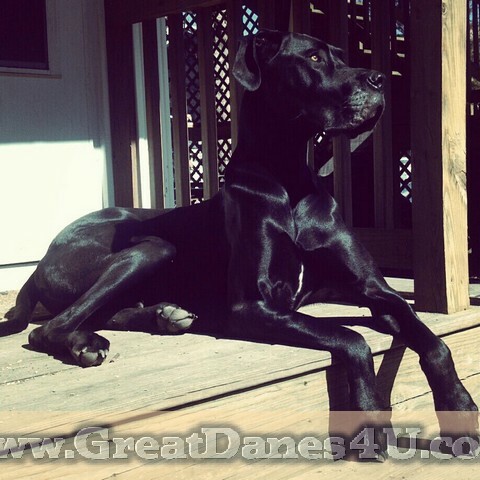 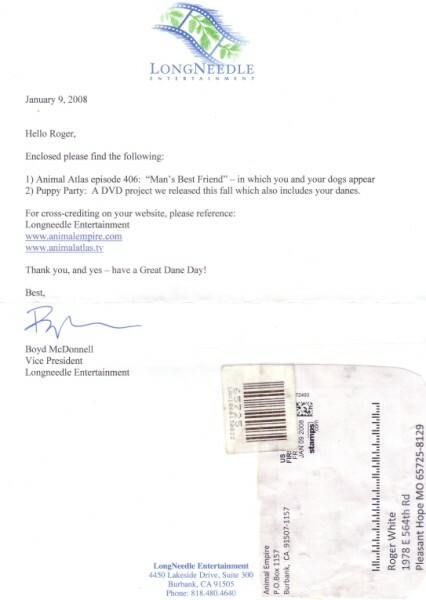 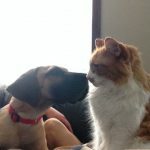 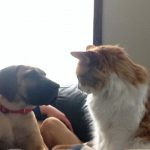 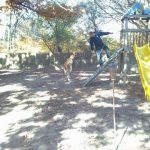 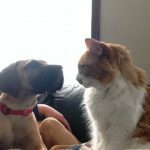 If you have one of my babies, please send photos and a Testimonial – Please! 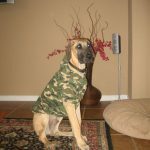 See Andrew’s Testimonial from Sgt. 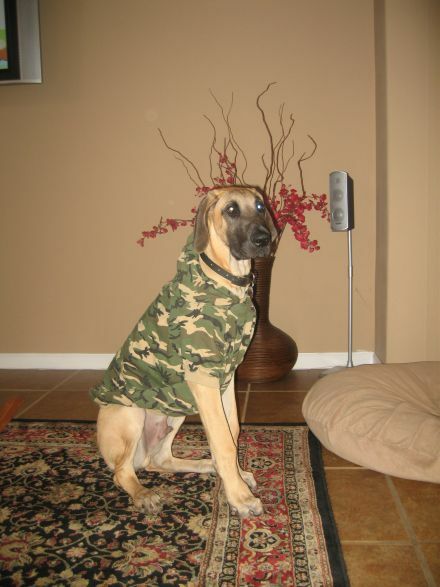 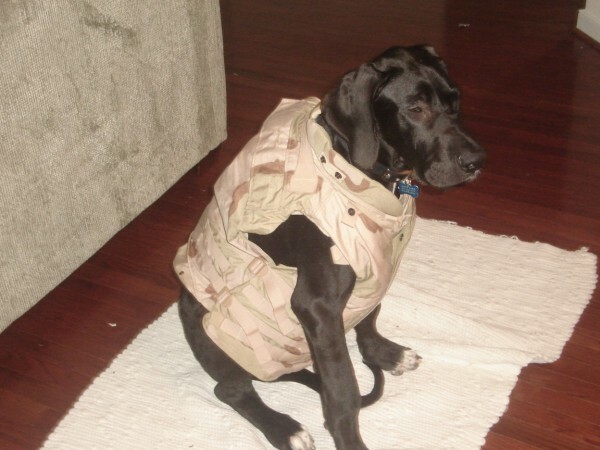 Burns after his last tour in Iraq. 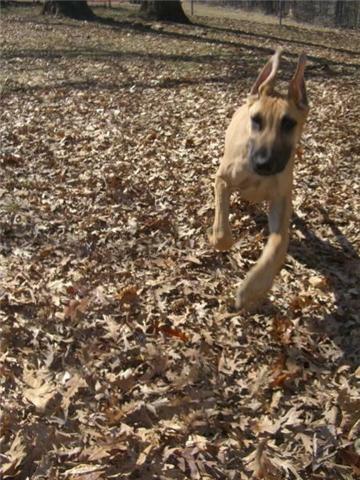 Ashur arrived Ft. 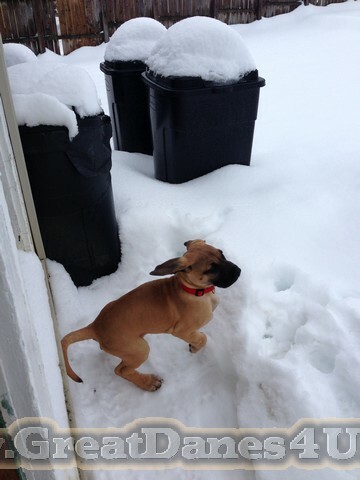 Drum, NY. 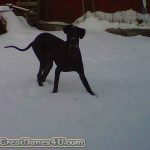 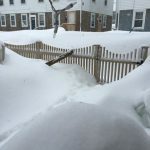 just before Christmas 2009 & the 42″ Snow. 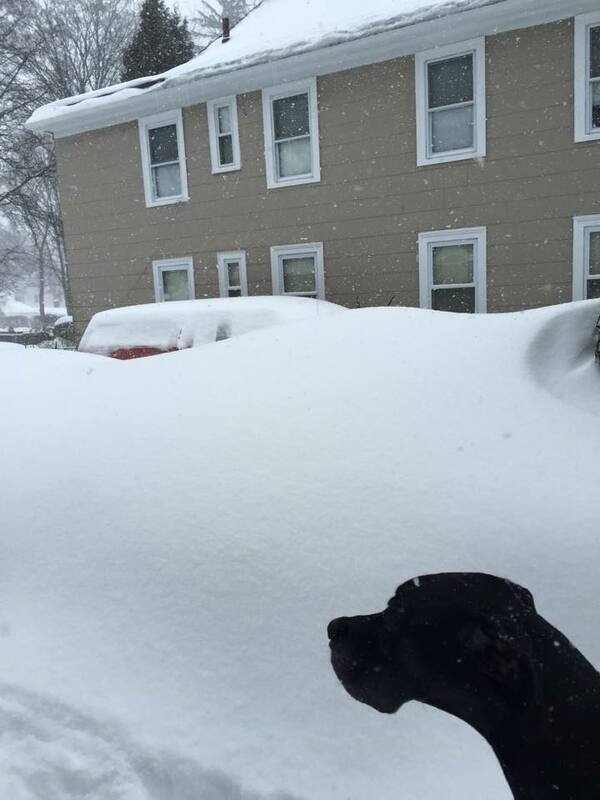 Ashur had to fly into Hartford, CT due to temps. 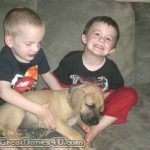 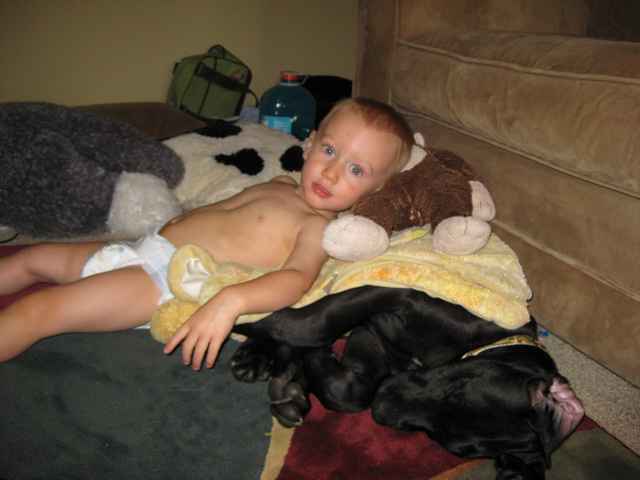 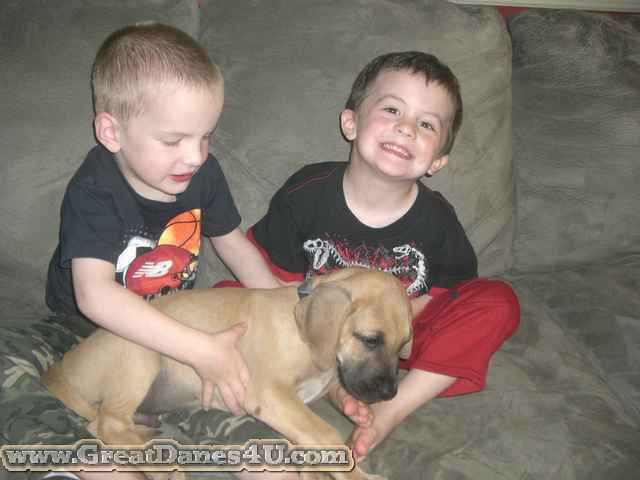 waiting on Crashed truck + updated photo..
Ashur new family totaled their truck on the ice fetching him. 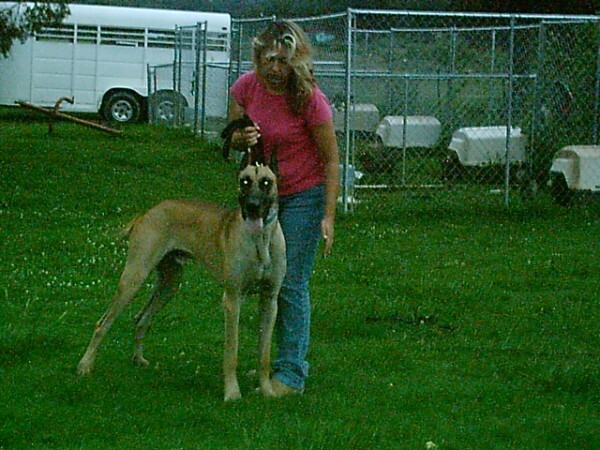 Aurora, Fawn Female that went to an Officer in PA.
Less than 3-weeks after arrival in PA.! 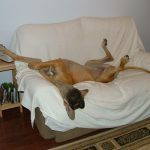 Pampered pooch Aurora lives with 3 cats… More photos to come! 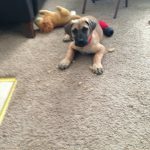 Bear was a 2010 Christmas present for a young lady in Memphis, TN. 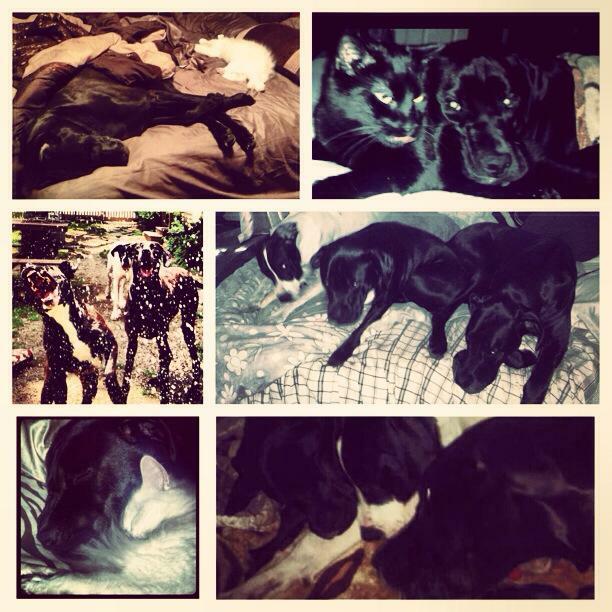 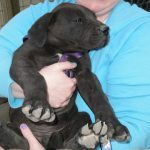 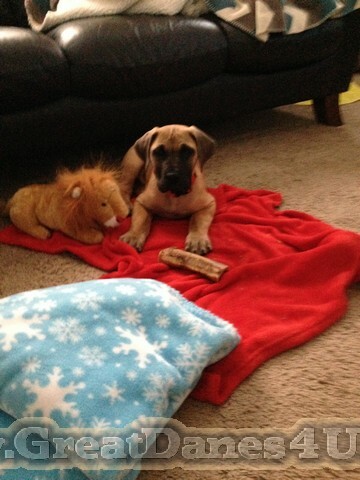 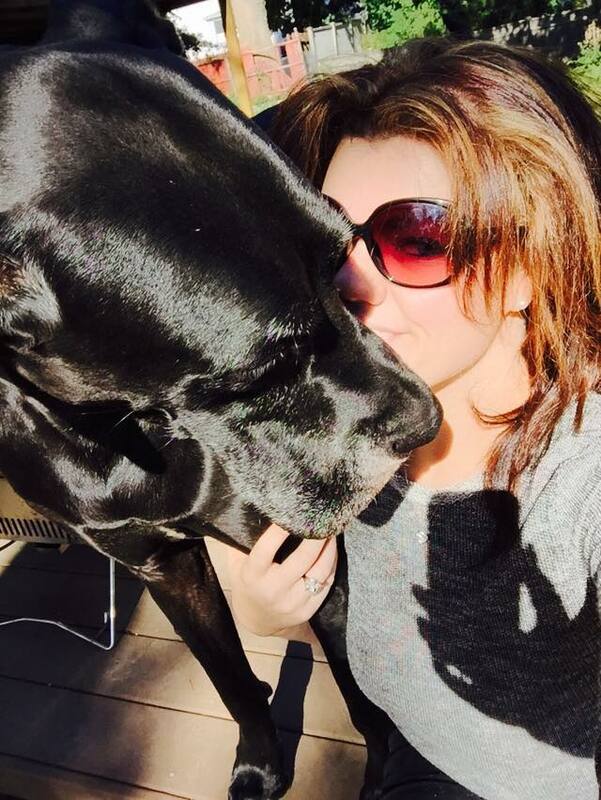 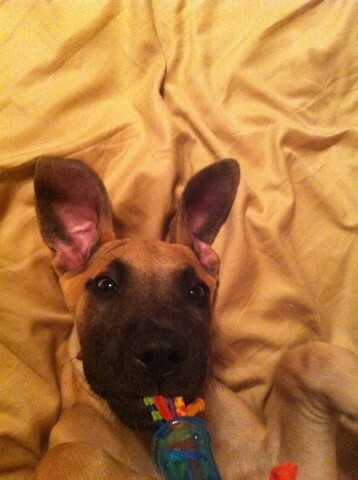 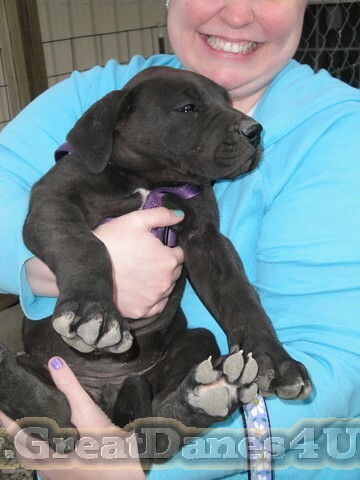 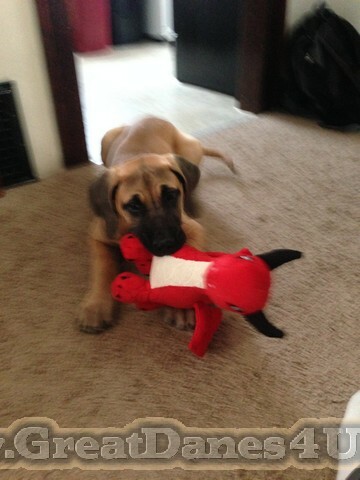 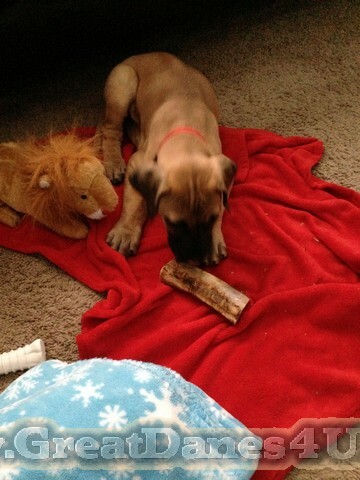 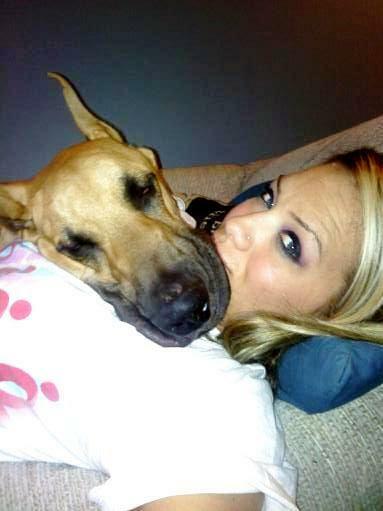 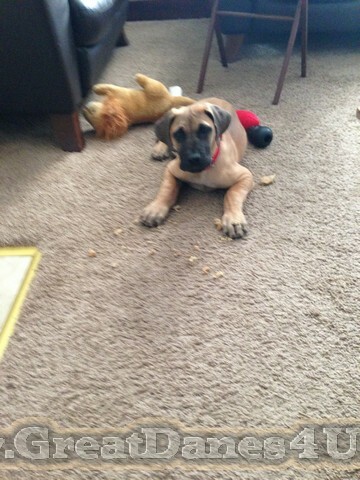 Bear’s owner begged her Mom for 1 of my pups ever since her neighbor got a pup from me! 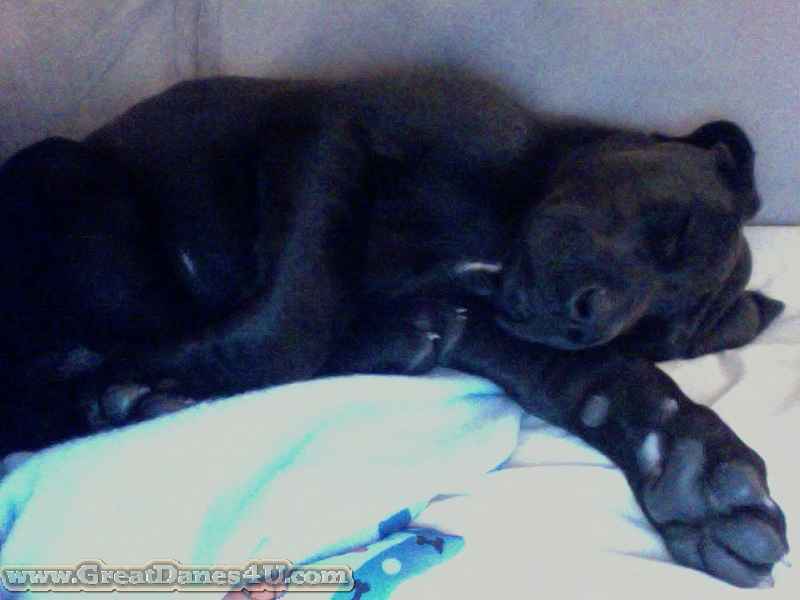 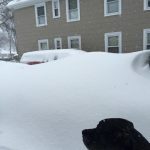 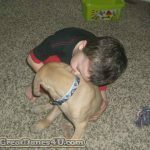 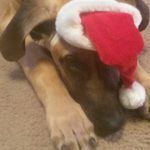 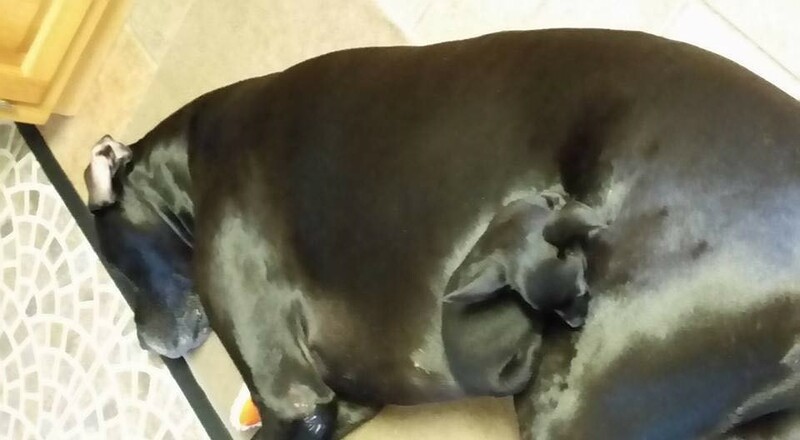 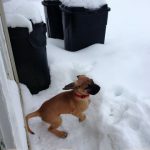 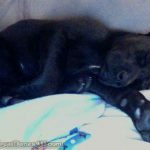 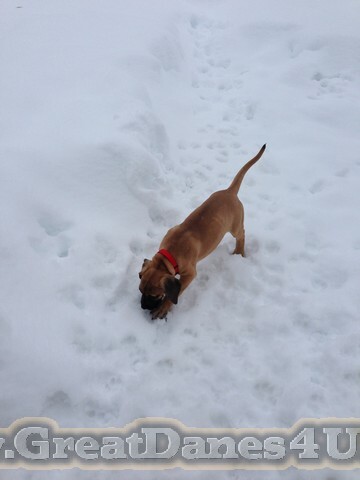 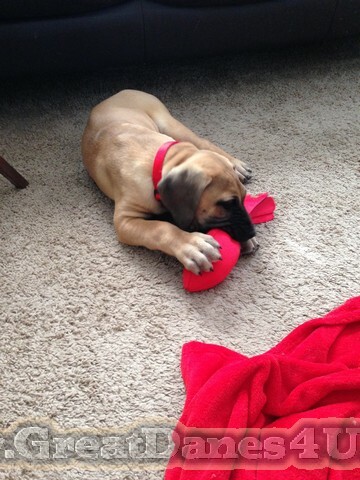 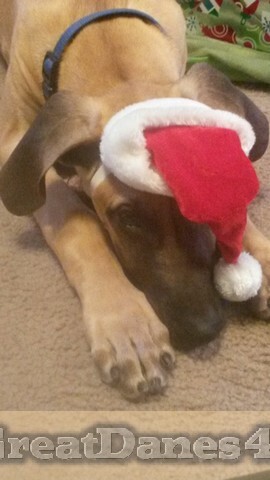 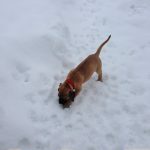 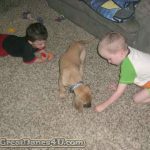 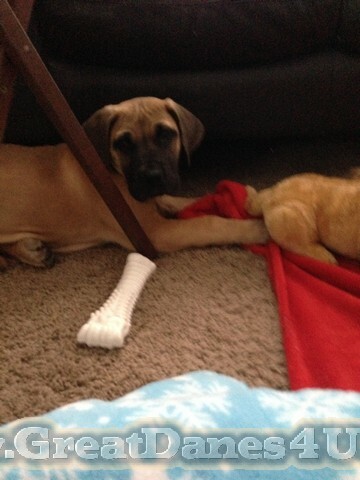 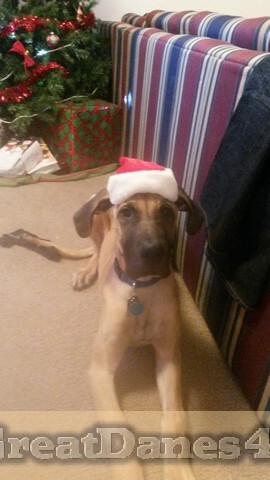 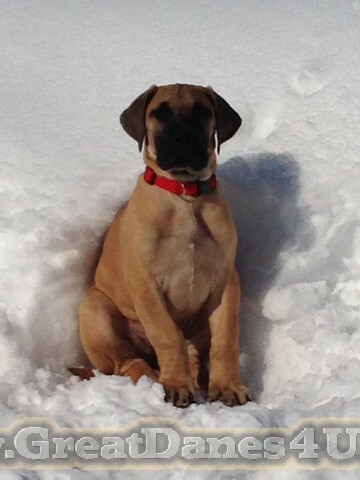 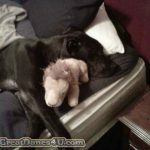 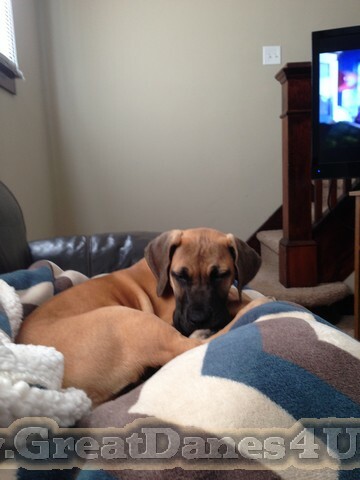 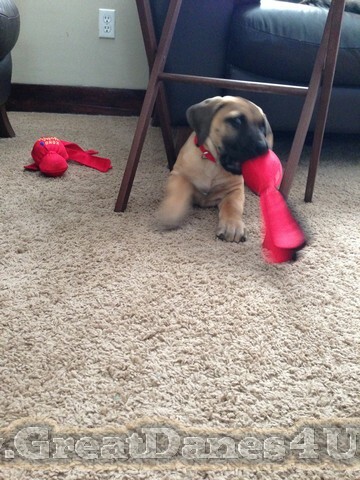 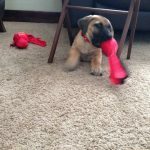 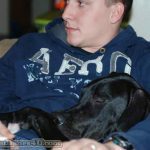 Dad traveled through Ice & snow Christmas Eve to get puppy home in time for Christmas AM! 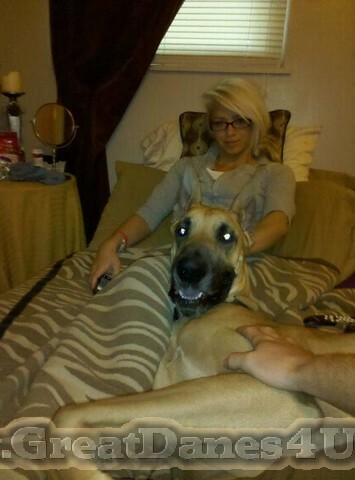 Drunk Again, but I am coool…. 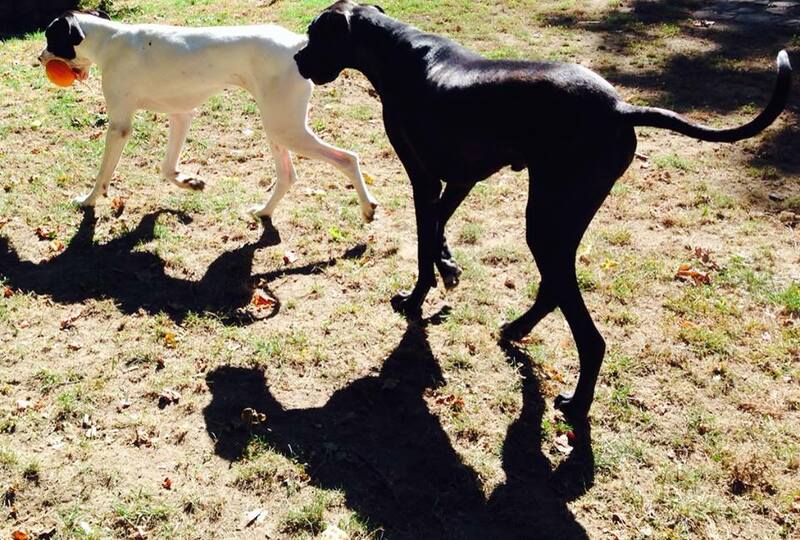 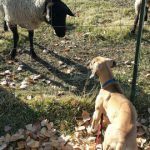 Bowser returns from St. Louis, Missouri to help pick up his Fawn & Black sisters. 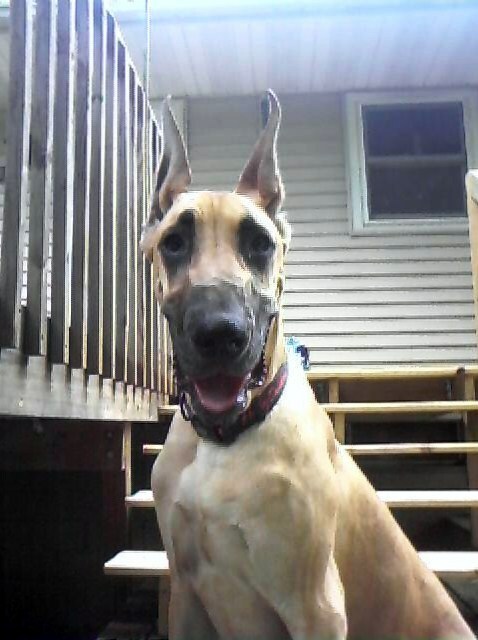 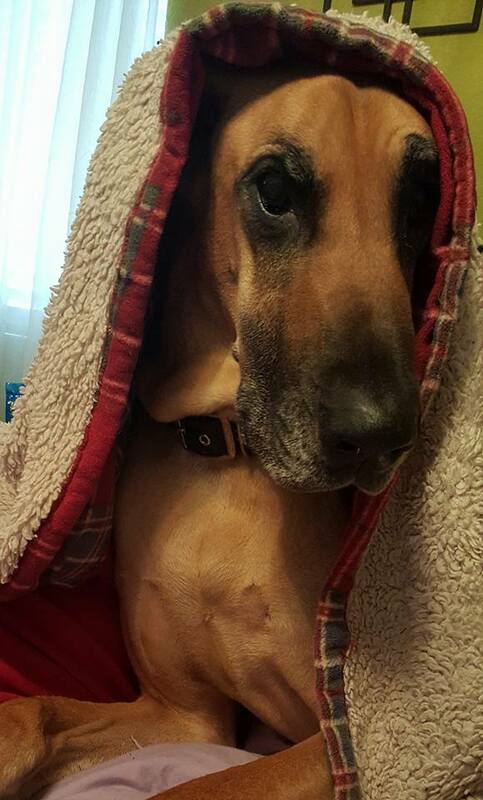 He is a fine looking pup! 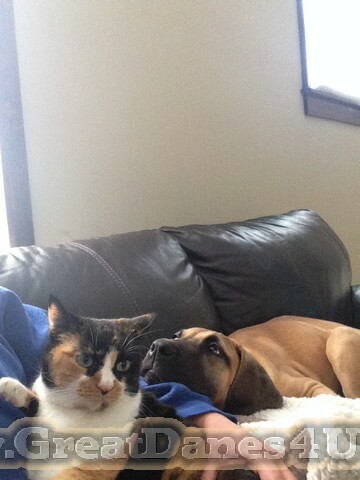 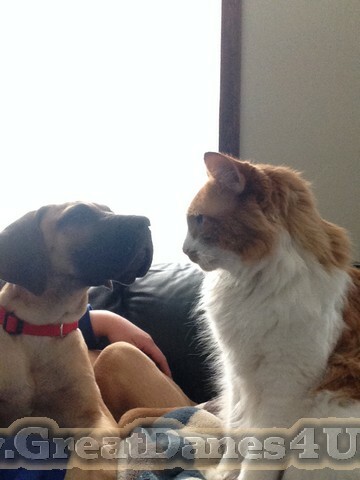 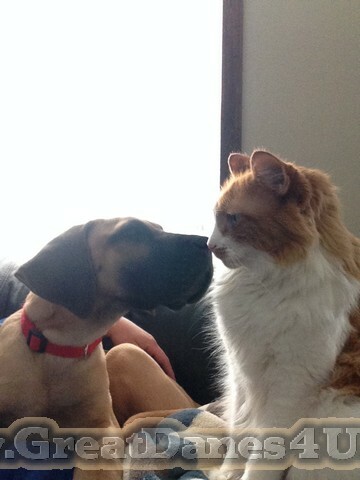 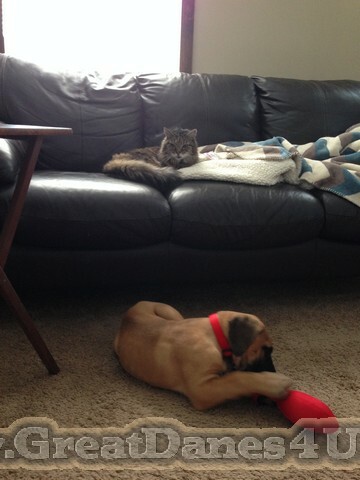 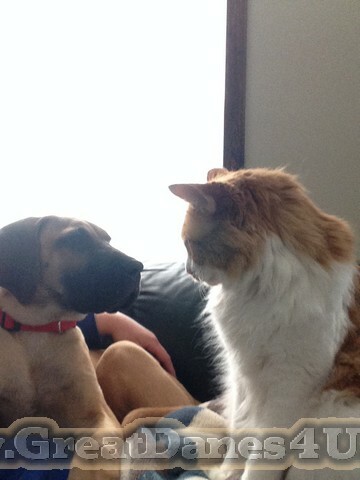 Halo & Bowza are buddies! 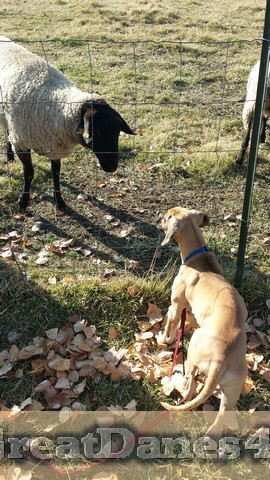 Bowza is after Bandit who swiped the pumpkin that owner brought home. 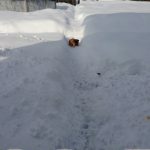 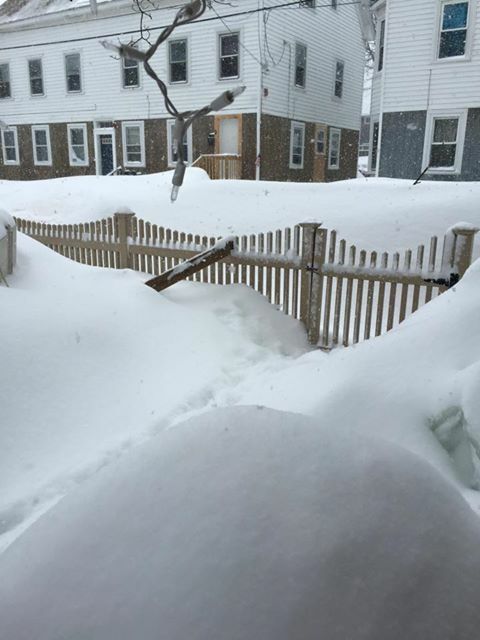 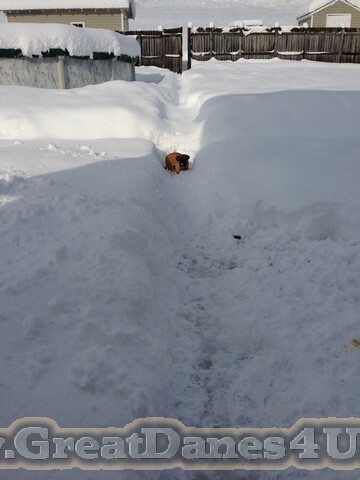 Of course they get snow but this DEEP! 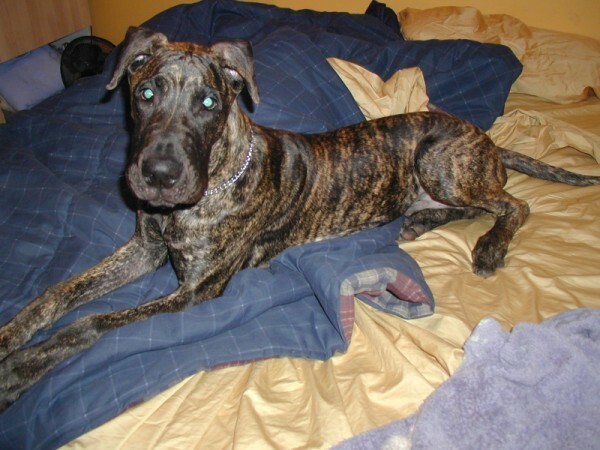 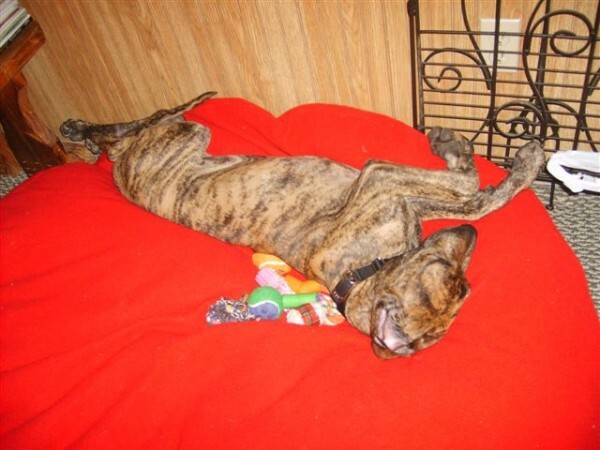 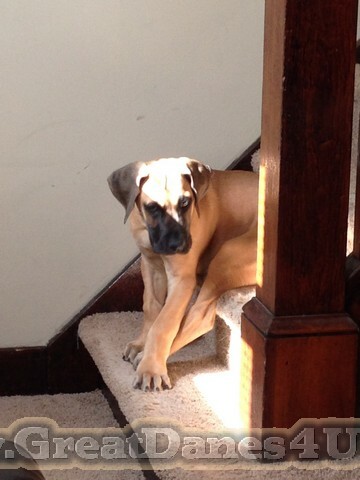 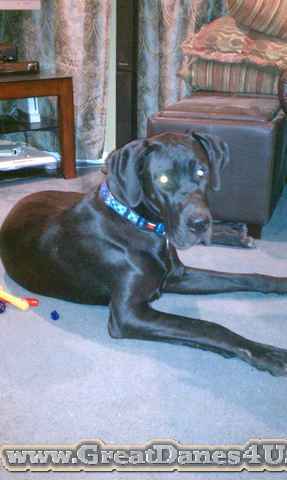 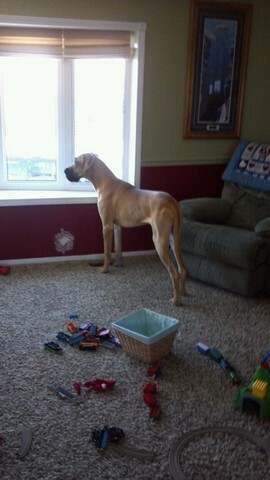 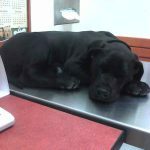 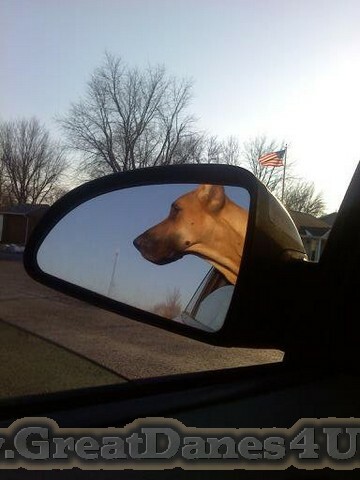 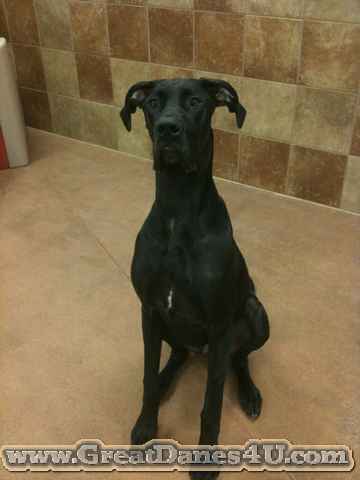 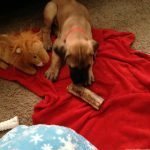 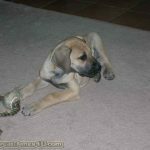 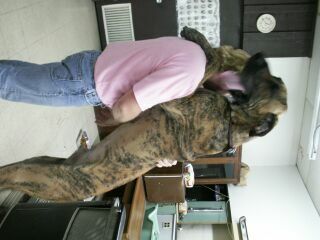 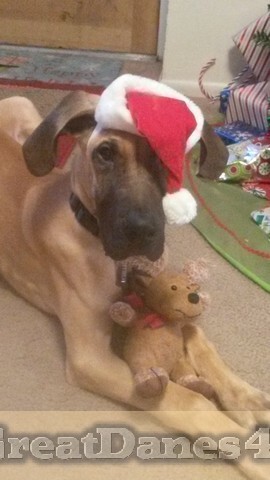 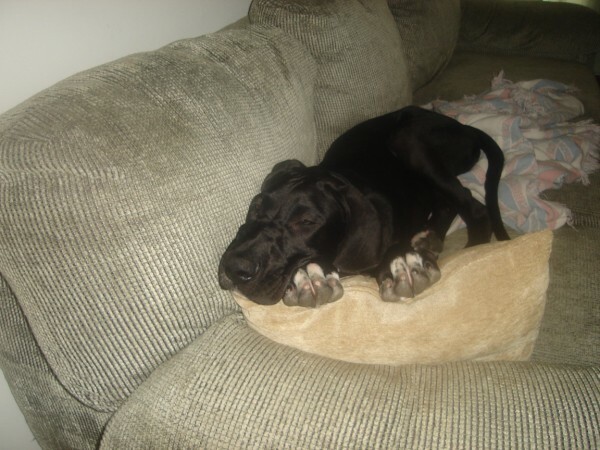 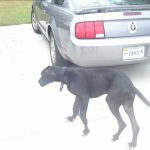 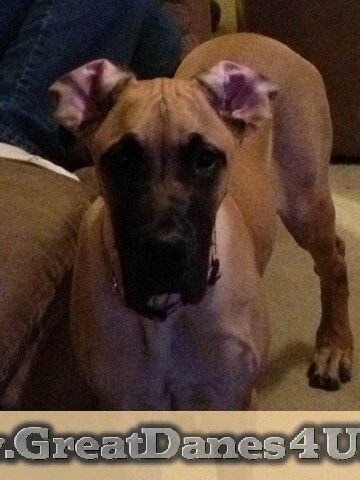 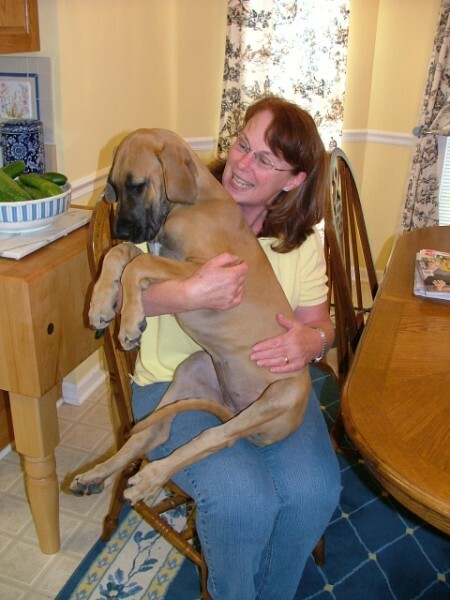 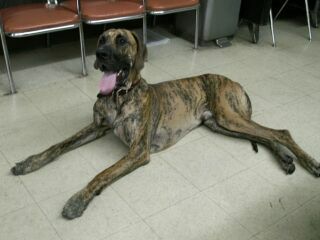 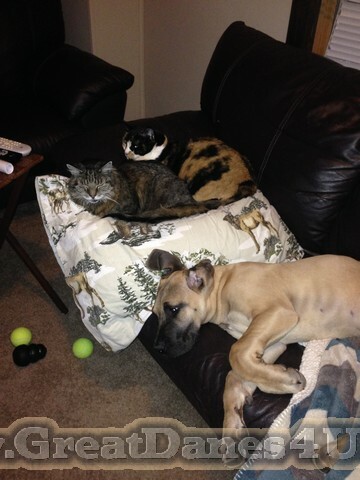 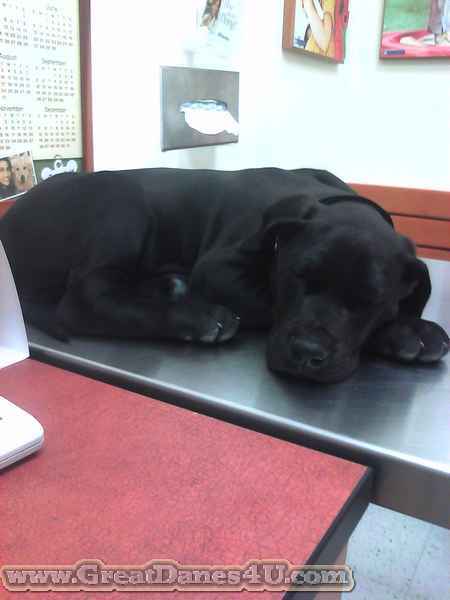 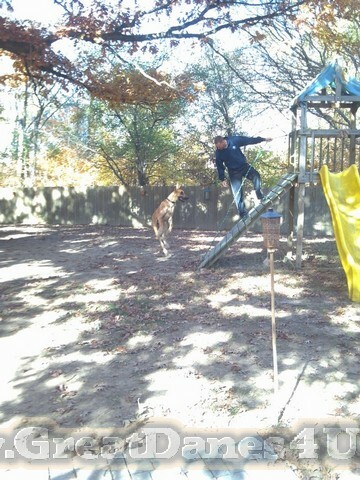 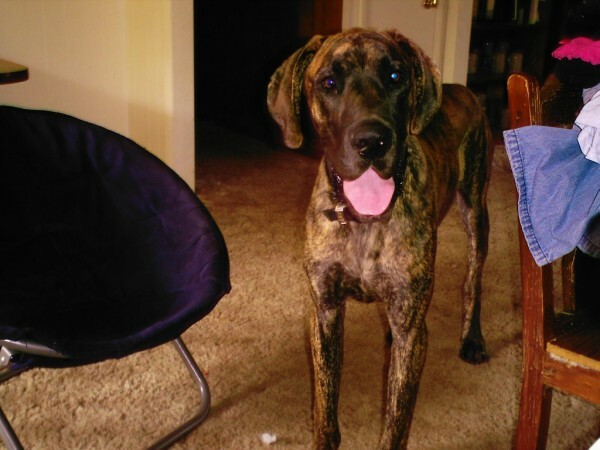 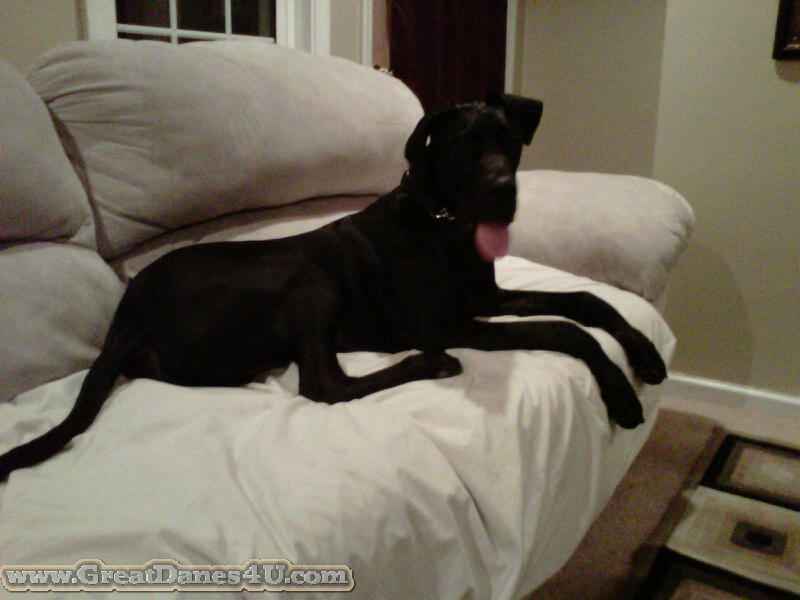 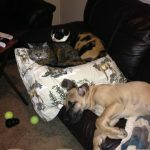 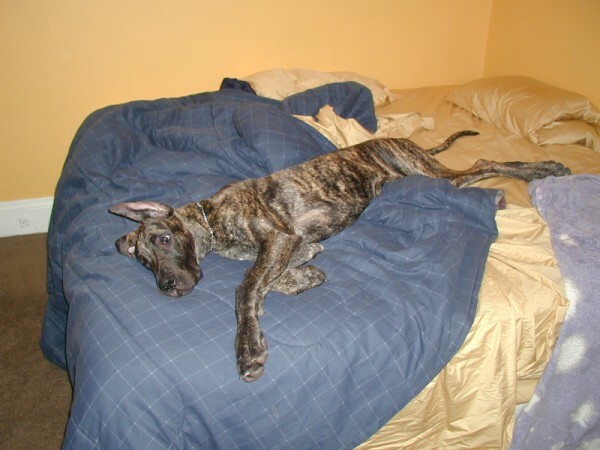 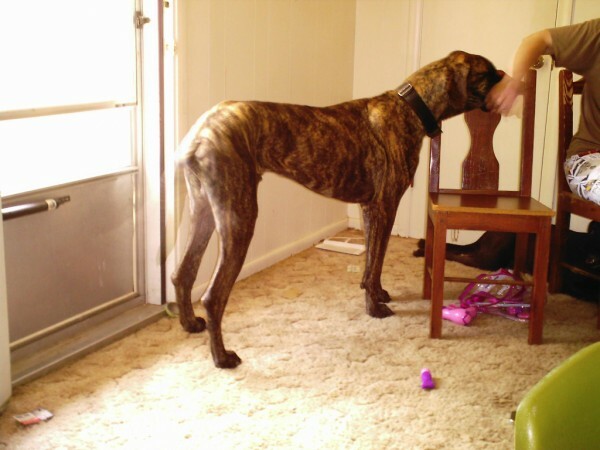 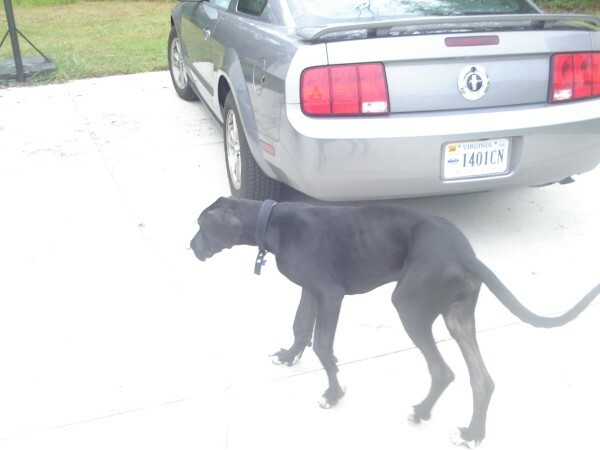 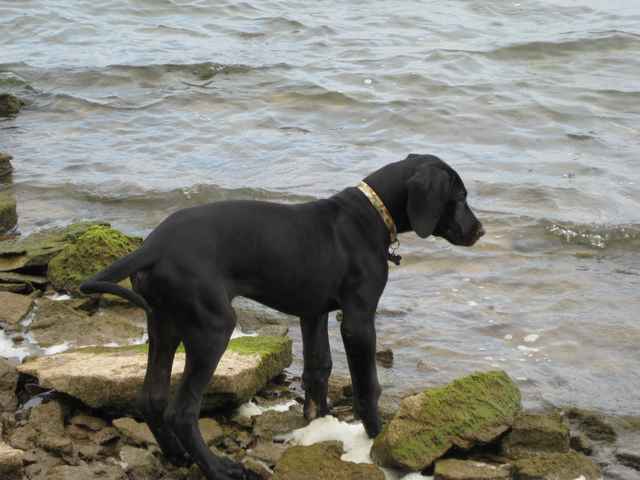 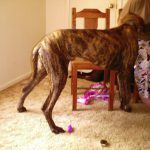 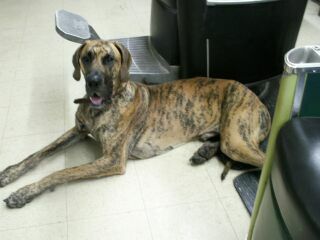 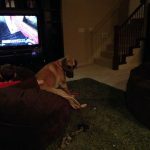 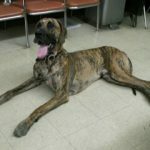 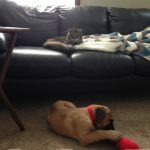 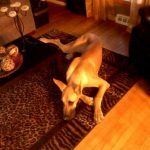 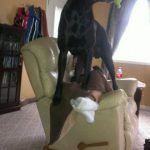 Coco near Springfield, Missouri about 8 months – she is a monster! 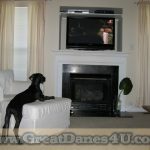 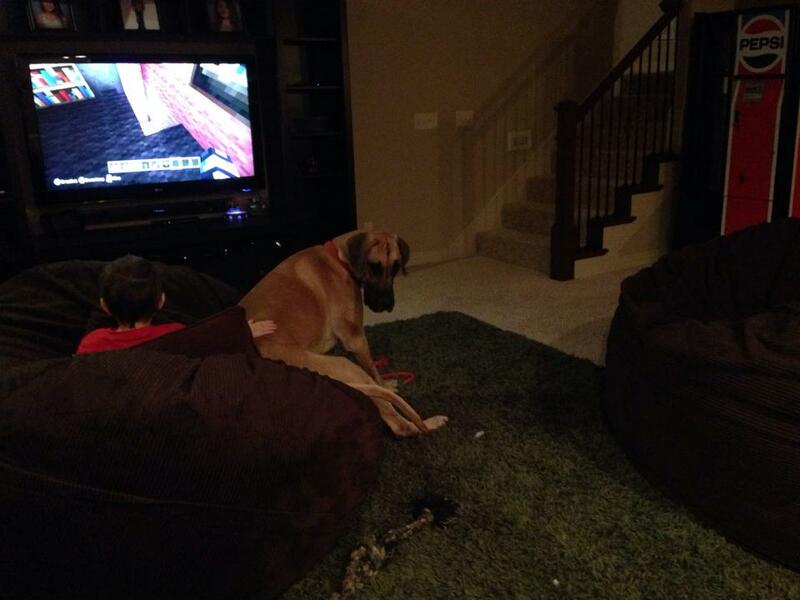 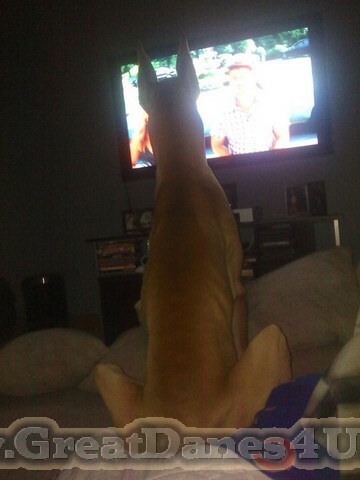 CoCo watches TV with all 4-feet off the Sofa! 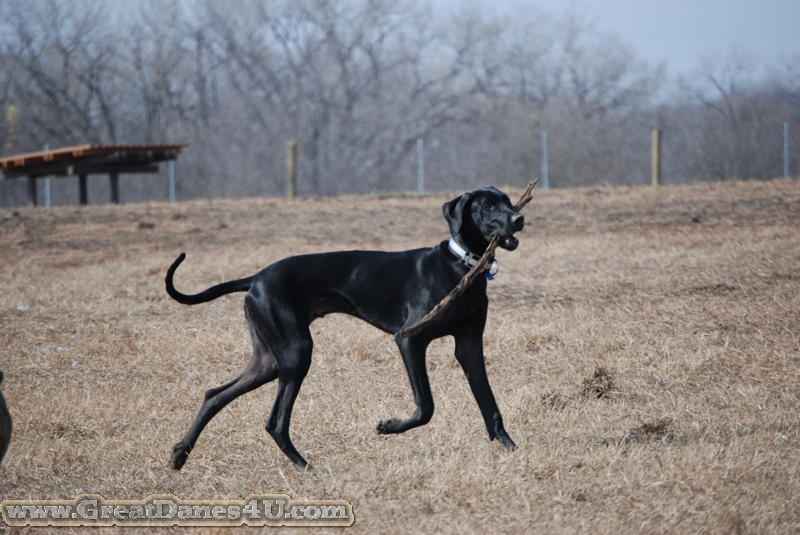 Daisy is near Tulsa, OK. 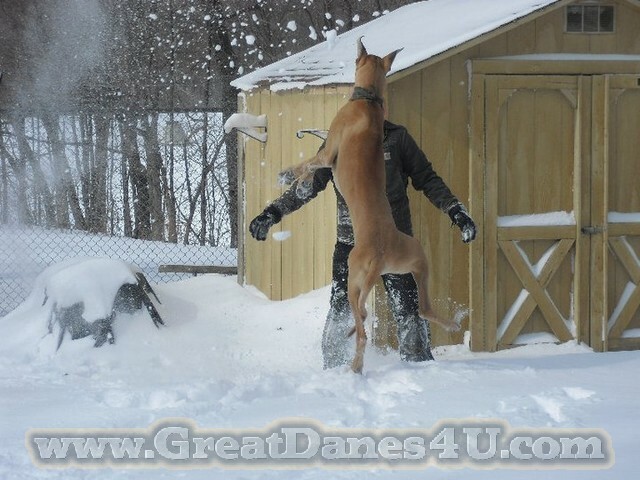 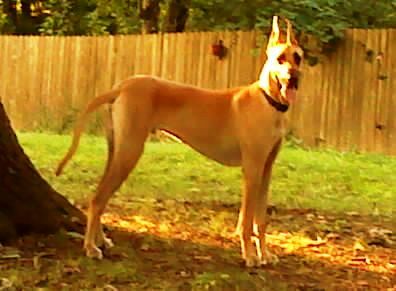 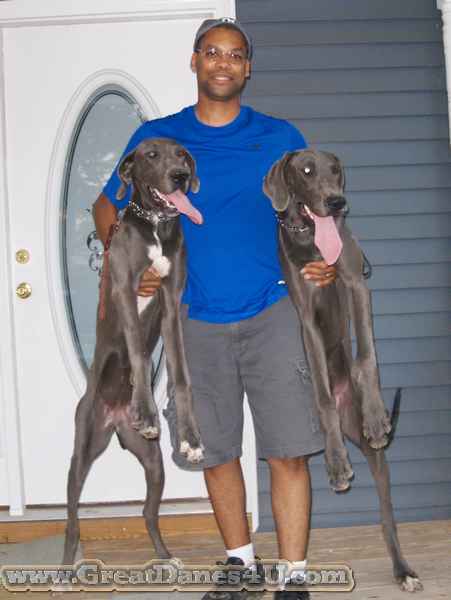 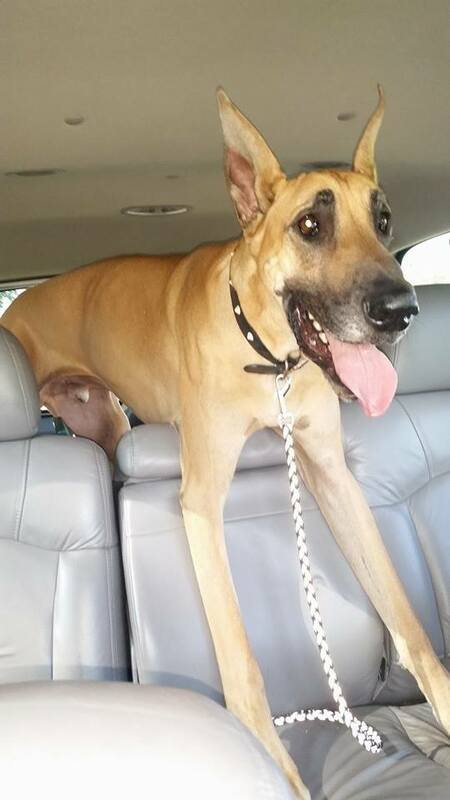 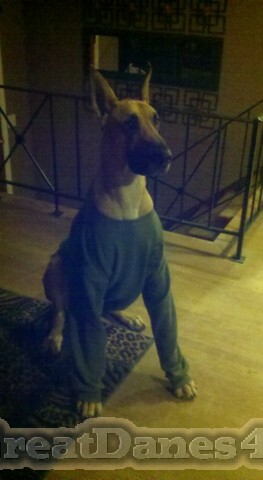 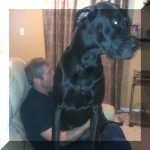 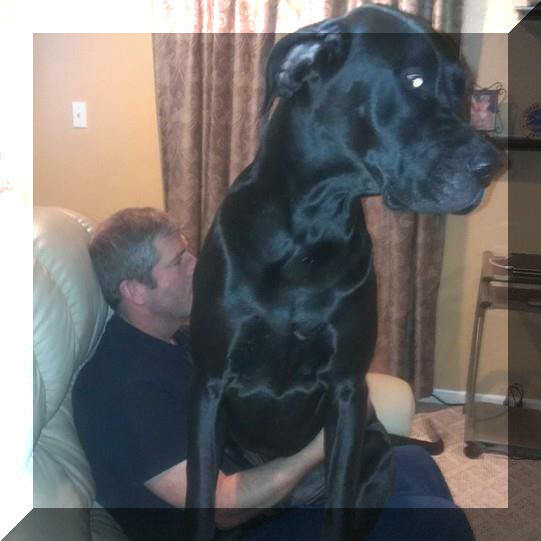 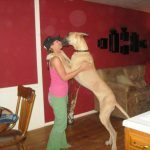 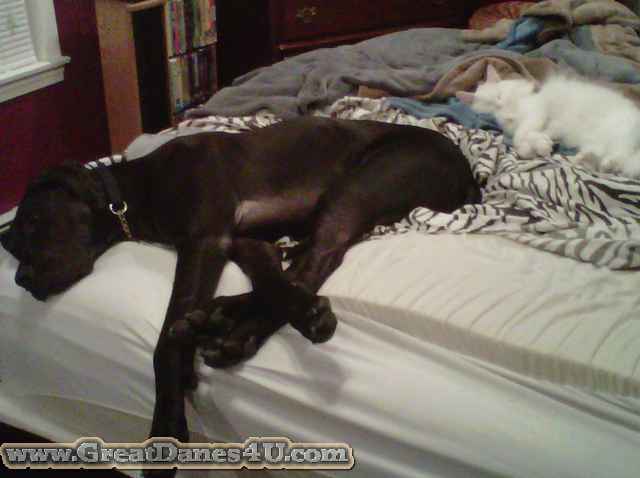 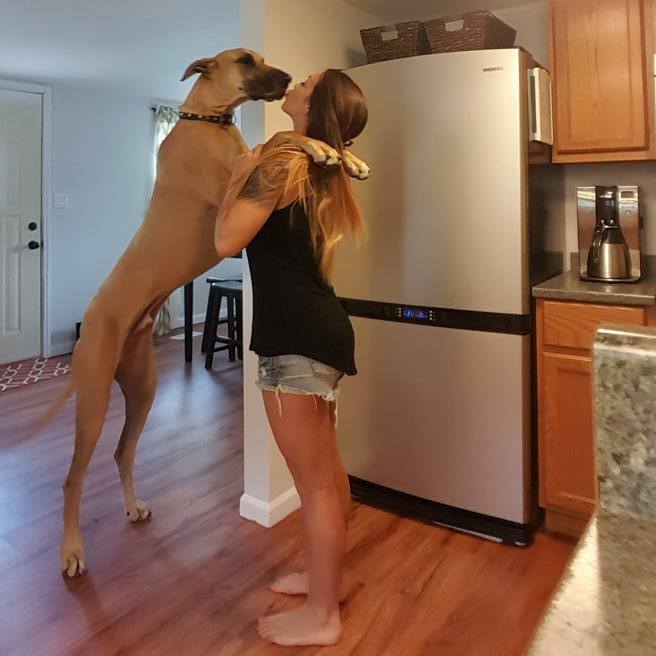 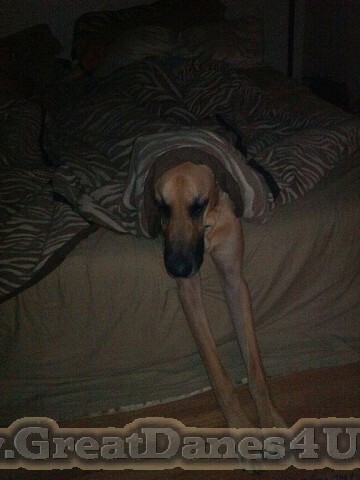 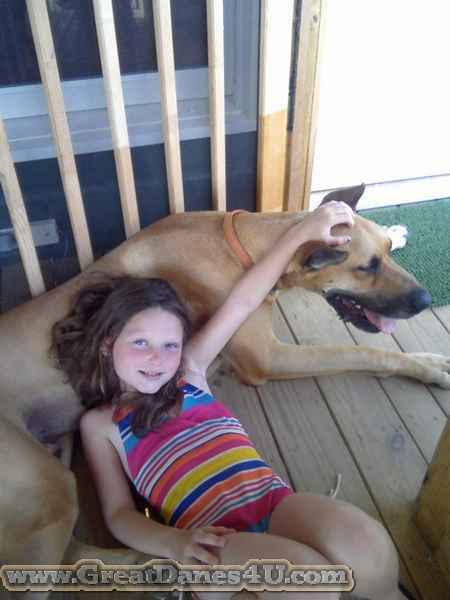 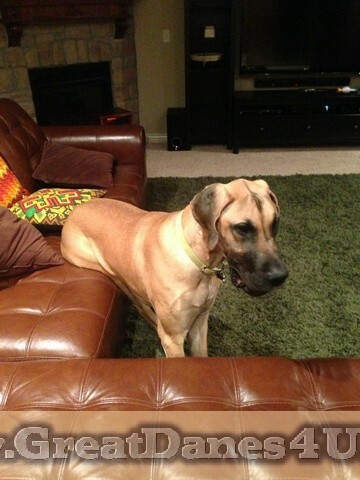 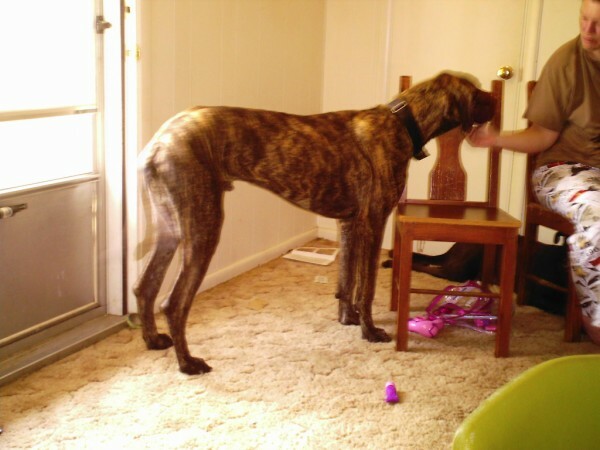 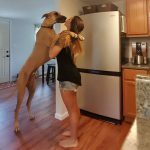 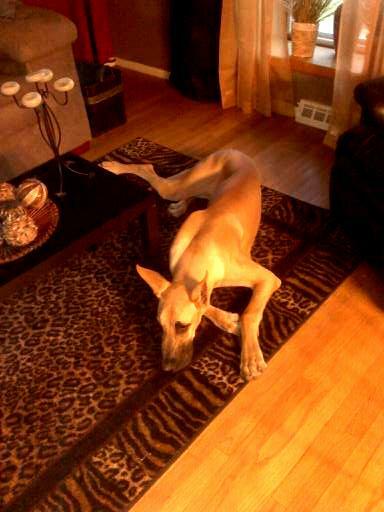 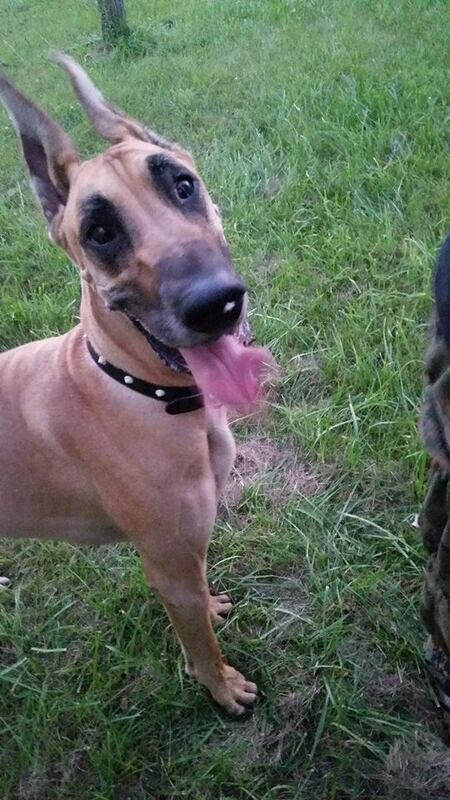 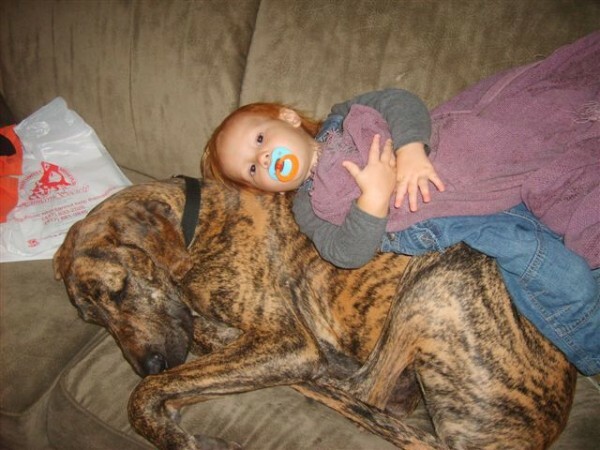 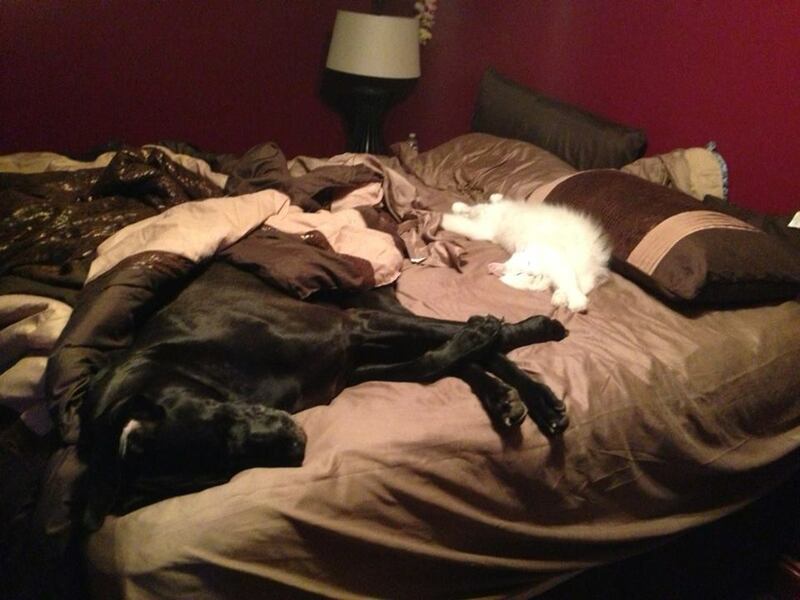 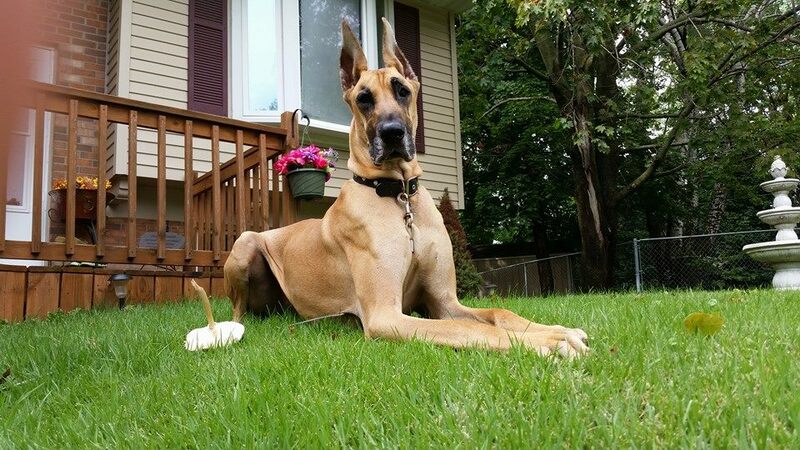 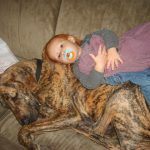 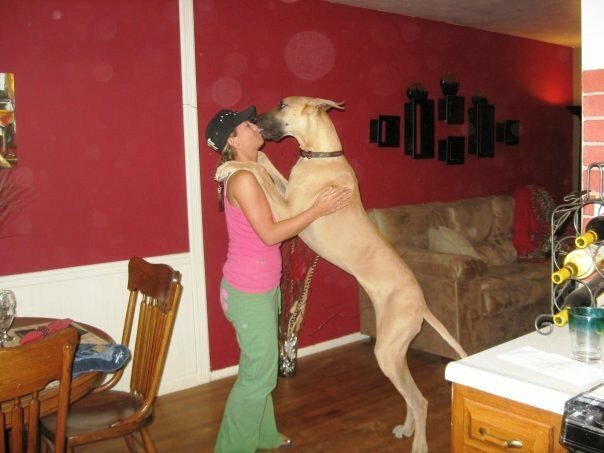 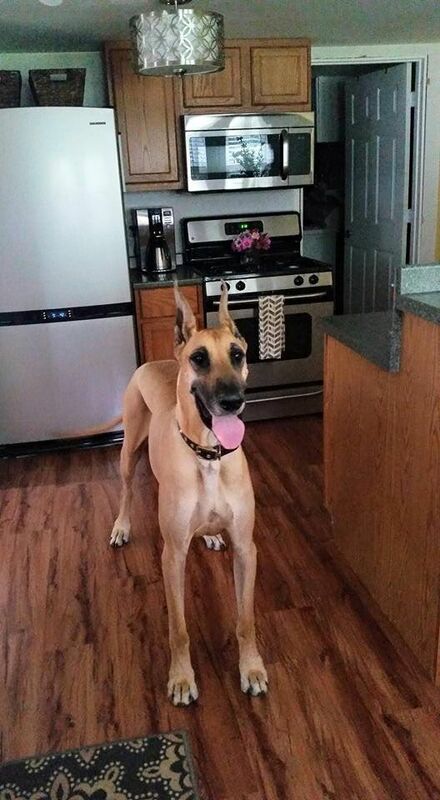 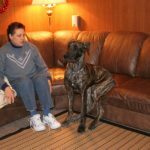 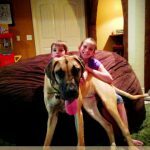 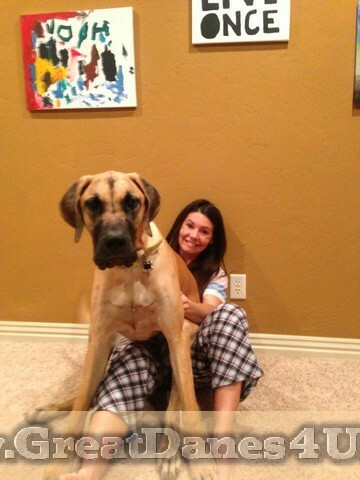 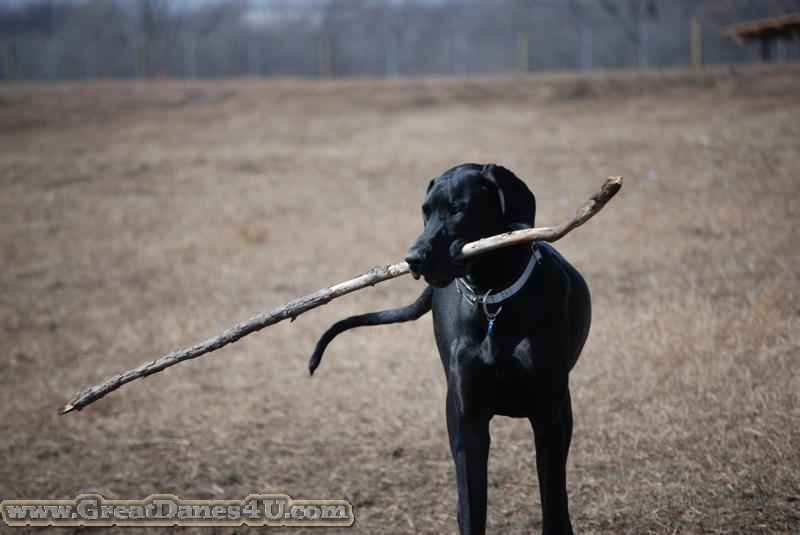 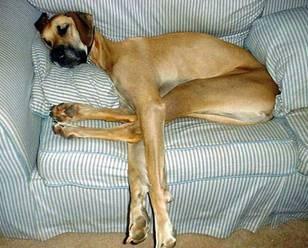 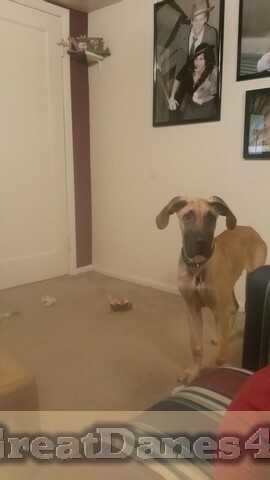 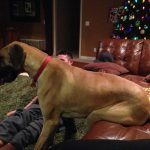 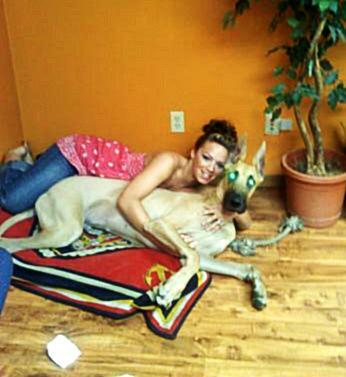 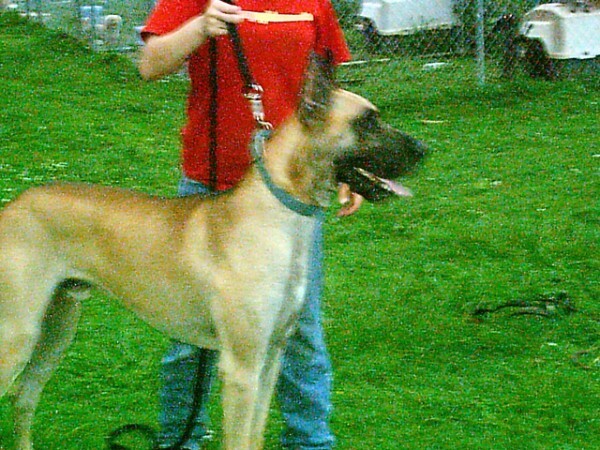 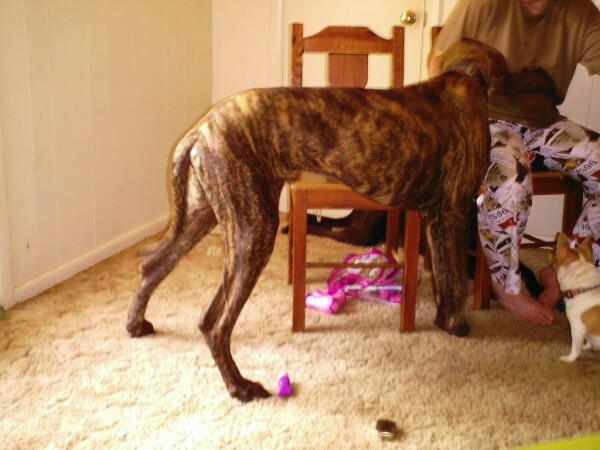 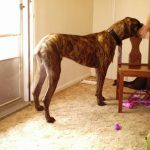 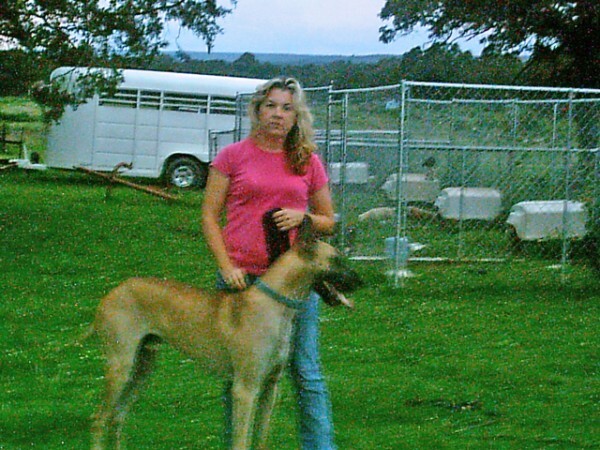 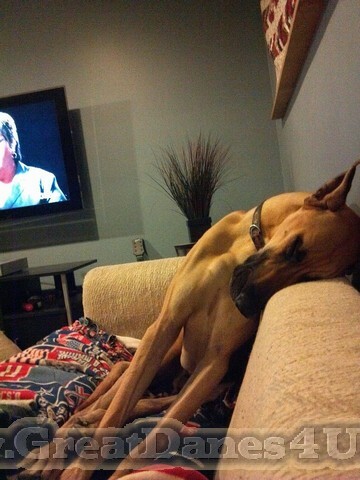 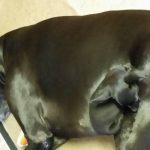 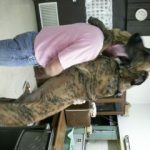 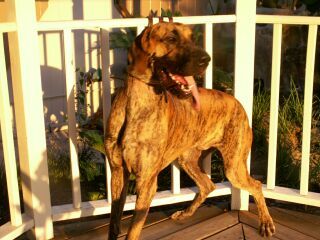 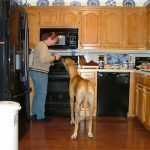 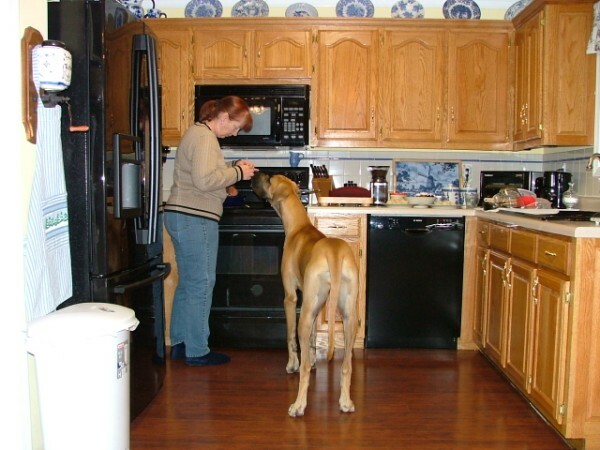 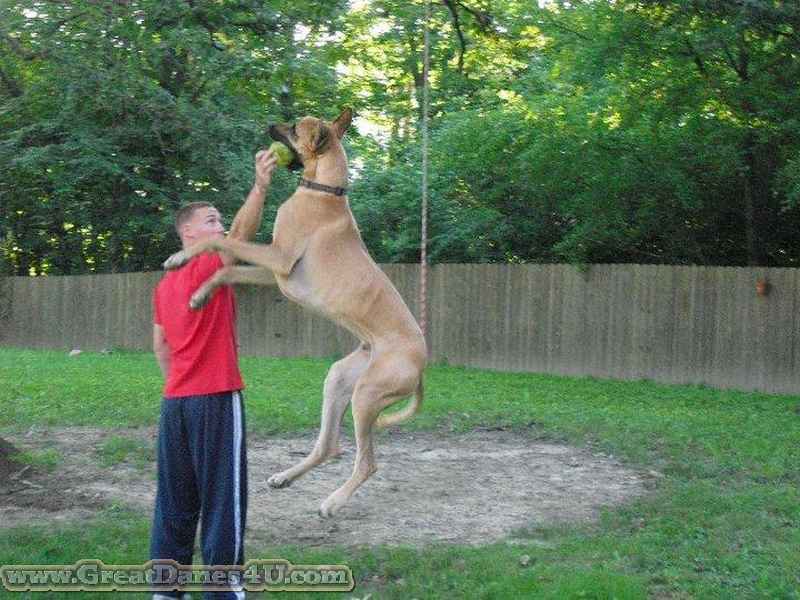 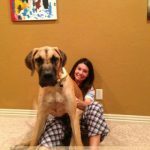 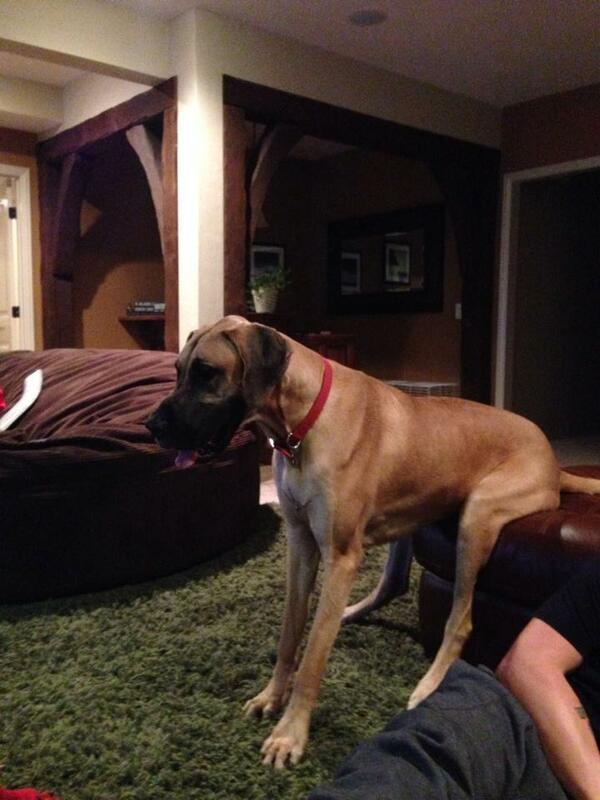 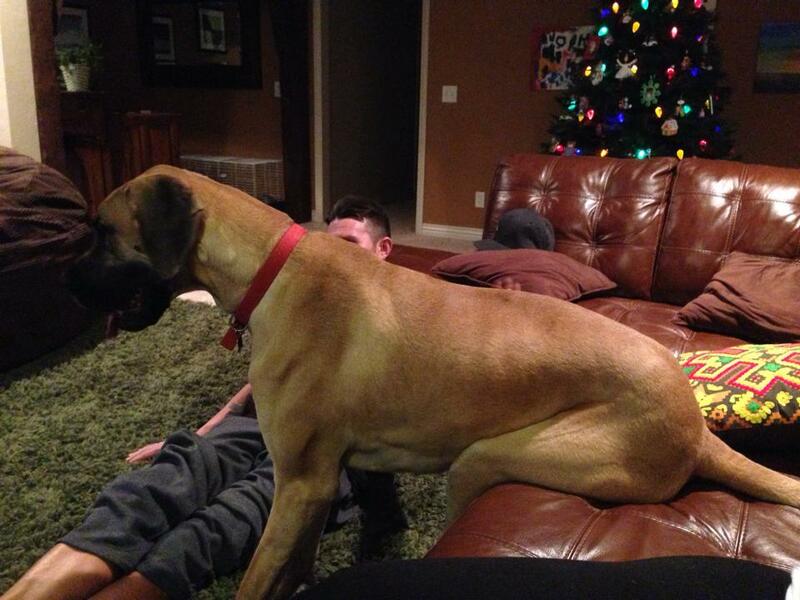 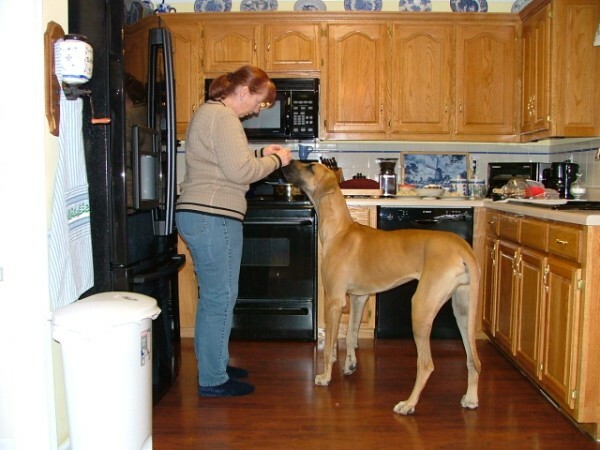 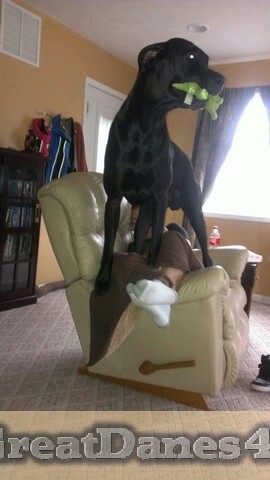 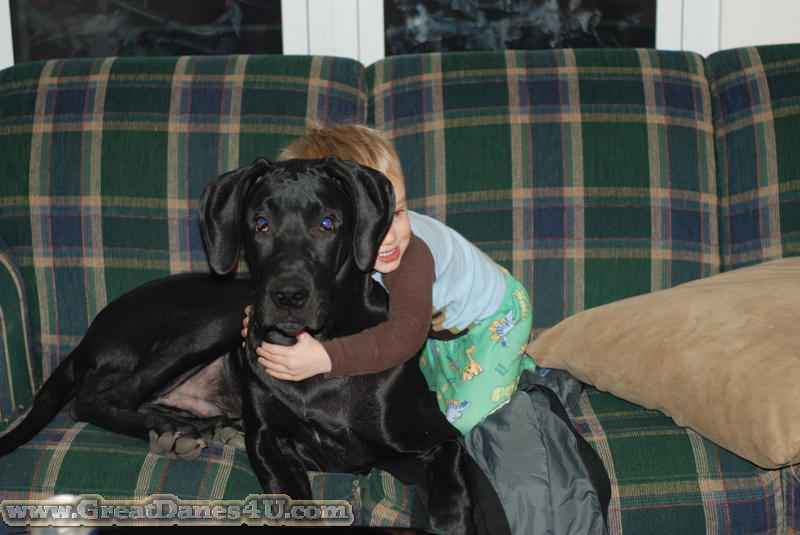 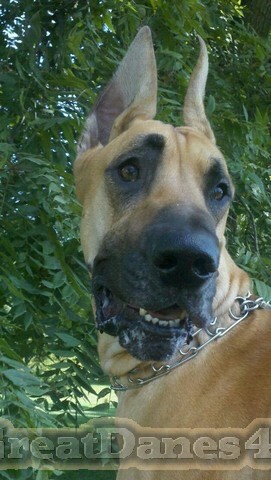 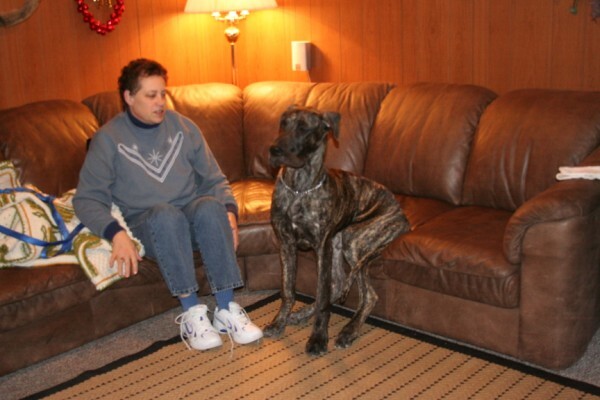 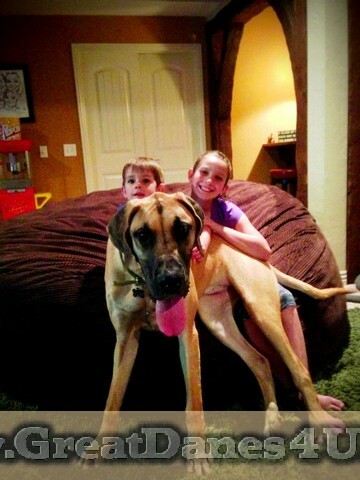 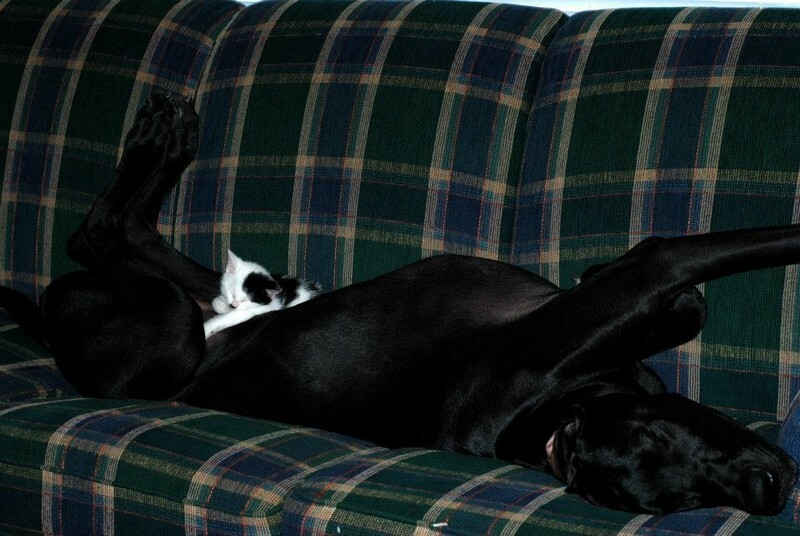 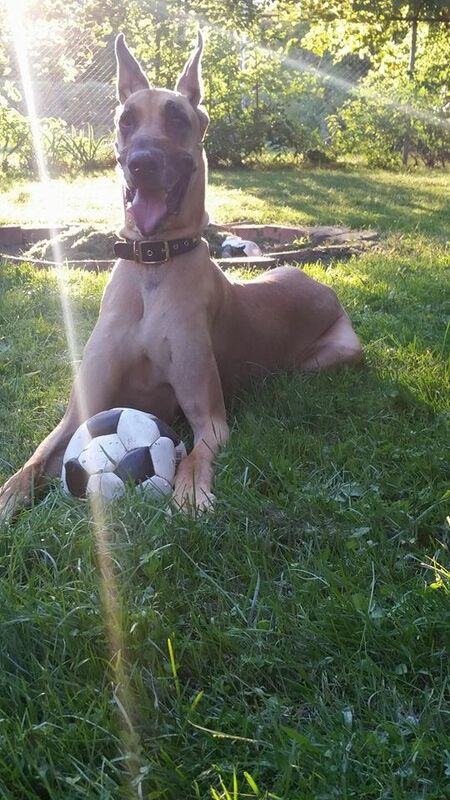 Some Danes get REALLY BIG! 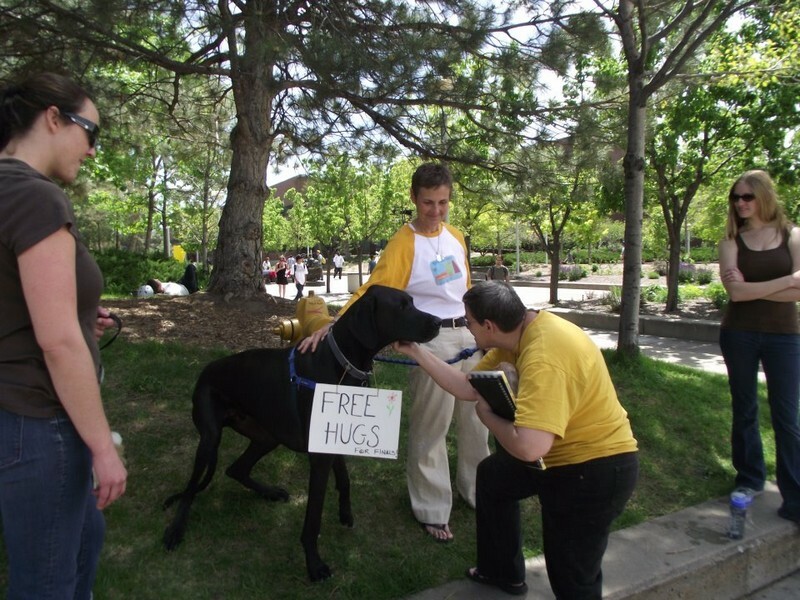 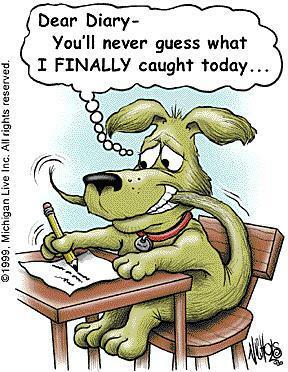 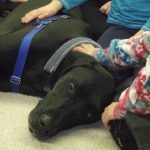 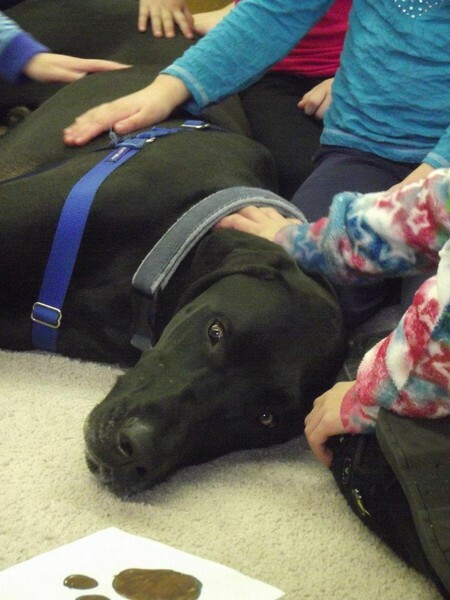 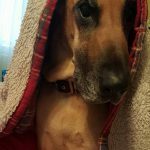 “Happy” is now a sought after Therapy Canine Companion! 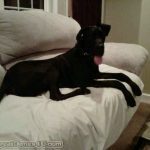 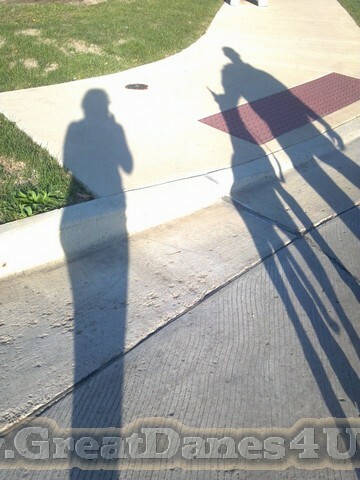 Jackson is now in Aurora, Ontario = CANADA!